DIE Lunæ, 2o Julii 1781. DIE Martis, 3o Julii 1781. DIE Mercurii, 4o Julii 1781. DIE Jovis, 5o Julii 1781. DIE Veneris, 6o Julii 1781. DIE Lunæ, 9o Julii 1781. DIE Martis, 10o Julii 1781. Viscount Mount Edgcumbe & Valletort. Ds. Abergavenny. Hodie 2a vice lecta est Billa, intituled, "An Act for enabling His Majesty to raise the Sum of One Million, for the Uses and Purposes therein mentioned." Ordered, That the House be put into a Committee on the said Bill To-morrow. Bp. Winchester takes the Oaths. This Day Brownlow Lord Bishop of Winchester took the Oaths, and made and subscribed the Declaration; and also took and subscribed the Oath of Abjuration pursuant to the Statutes. Hodie 2a vice lecta est Billa, intituled, "An Act for granting to His Majesty a certain Sum of Money out of the Sinking Fund, and for applying certain Monies therein mentioned for the Service of the Year One thousand seven hundred and eighty-one, and for further appropriating the Supplies granted in this Session of Parliament." Hodie 2a vice lecta est Billa, intituled, "An Act for repealing the Duties payable upon Chocolate made in Great Britain, and for granting certain Inland Duties upon Cocoa Nuts in lieu thereof; for the better and more effectual securing the Revenue of Excise, and of the Inland Duties under the Management of the Commissioners of Excise, and for preventing Frauds therein; for the more punctual and ready Payment of the Allowances to be made to Brewers out of the additional Duties imposed on Malt; and for rectifying a Mistake in an Act made in this present Session of Parliament, with respect to the exempting of Candles from the additional Duty of Five Pounds per Centum upon the Duties of Excise imposed by the said Act." Phillips's Powder, Papers relative to, ordered. Ordered, That the proper Officer do lay before this House, "A Copy of the Reference from the Board of Trade and Plantations to the Lords Commissioners of the Treasury, dated 8th August 1777, relative to Mr. Phillips's Powder:"
Also, "A Copy of a Letter from the Grenada Merchants and Planters to the Lords of the Treasury in 1777, relative to Mr. Phillips's Powder for killing Cane Ants." Hodie 3a vice lecta est Billa, intituled, "An Act to render valid certain Marriages, solemnized in certain Churches and public Chapels in which Banns had not usually been published before or at the Time of passing an Act made in the Twenty-sixth Year of King George the Second, intituled, "An Act for the better preventing of clandestine Marriages." To return the said Bill, and acquaint them, That the Lords have agreed to the same with some Amendments, to which their Lordships desire their Concurrence. The Lord Chancellor acquainted the House, "That Thomas Twisleton, Chevalier, was attending with his Writ of Summons to Parliament, directed to him by His Majesty, in pursuance of the Resolution of the House of the 21st Day of June last, laid before His Majesty relating to the Barony of Say and Sele:"
George the Third, by the Grace of God of Great Britain, France, and Ireland, King, Defender of the Faith, and so forth: To Our Right Trusty and Well-beloved Thomas Twisleton of Saye and of Sele Chevalier, Greeting. Whereas Our Parliament, for arduous and urgent Affairs, concerning Us, the State and Defence of Our Kingdom of Great Britain, and the Church, is now met at Our City of Westminster, We, strictly enjoining command you, under the Faith and Allegiance by which you are bound to Us, that considering the Difficulty of the said Affairs, and Dangers impending, all Excuses being laid aside, you be personally present at Our aforesaid Parliament, with Us, and with the Prelates, Nobles and Peers of Our said Kingdom, to treat of the aforesaid Affairs, and to give your Advice: And this you may in no wife omit, as you tender Us and Our Honour, and the Safety and Defence of the said Kingdom and Church, and the Dispatch of the said Affairs. Witness Ourself at Westminster, the Twenty-ninth Day of June, in the Twenty-first Year of Our Reign. His Lordship took the Oaths, and made and subscribed the Declaration, and also took and subscribed the Oath of Abjuration pursuant to the Statutes, and then took his Place on the Barons' Bench next after the Lord Petre. Garter King at Arms delivered in at the Table his Lordship's Pedigree, pursuant to the Standing Order. It was moved, "That the said Petition be now read:"
Q. "Whether you are not One of the Commissioners for the Sick and Hurt?" Q. "Whether you have been lately at Mill Prison at Plymouth?" A. "I have not myself been there lately; a Commis sioner and Member of our Board has been there lately." Q. "What Member of your Board?" A. "Mr. Lulman the Second Commissioner." Q. "Are you One of the Commissioners for the Sick and Hurt?" Q. "Have you been lately at Plymouth?" A. "I was at Plymouth the 5th of June, at Mill Prison." Q. "How many American Prisoners are there there?" A. "Two Hundred and Twenty-four the Number were at that Time as nearly as I remember." Q. "Has there been heretofore any regular Allowance of Cloathing given to the American Prisoners?" A. "Yes, there has; they have One Jacket, and a Duplicate of every other Part of Cloathing when they are wanted." Q. "Has that Allowance been given at any fixed Periods, at any certain Distance of Time?" A. "I believe from the First of their Commitments it has been so; I have been at the Board Two Years, and I find it has been allowed them ever since they were committed." Q. "Has that been given at any particular Period?" A. "Not at any particular Period, but at the Time it is wanted it is the Custom of the Agent to call the Prisoners together, and when there are any Deficiencies of Cloathing he makes a Memorandum of it, and demands it at the Board, provided there are none in Store, which is almost always the Cafe, and then they are supplied in Shirts, Shoes, Stockings, or Caps, or what they want." Q. "Is there any Minute of your Board directing the Allowance?" A. "No, I believe Doctor Farquharson has the Minute." Q. "Of what these Allowances are?" A. "Yes, of what these Allowances are." Q. "Do those Minutes express whether they are to be allowed at any particular Periods?" A. "Not at any particular Period, but when they are wanted." Q. "And what has been also the Practice?" Q. "What Allowance of Bread have they?" A. "Seven Pounds a Week, a Pound a Day." Q. "What Allowance have the French Prisoners of War?" A. "The French Prisoners of War have a Pound and a Half." Q. "From whom is that Allowance made?" A. "I believe in consequence of the same Quantity being allowed our Prisoners in France." Q. "Were the French Prisoners always at that Allowance since the Commencement of Hostilities, or has it been encreased?" A. "Always that Allowance since the Commencement of Hostilities this War." Q. "What is the Allowance of Spaniards then?" A. "The same as the French, a Pound and a Half of Bread a Day." Q. "What Allowance have the Dutch?" A. "A Pound and a Half also." Q. "When you visited the Prison, did you find that there was any want of Cloathing for American Prisoners?" A. "In a very trifling Respect, there were Two or Three Men without Stockings, which was all that I found; except Bread, the Americans wanted more Bread; but there was a large Supply of Stockings going down to them on the Road; prior to my going, an Order was sent for that Supply." Q. "Has there been the same Allowance lately to the American Prisoners of Cloathing as formerly?" Q. "There has been no Alteration?" Q. "Have you seen their Petition to this House?" Q. "Do you know at all what has given rise to that Complaint of want of Cloathing?" A. "No, I do not, I know no Reason for it, they are amply supplied; I think the Agent told me "it has been a Custom sometimes for them to sell their Things to the French, by throwing them over the Wall, and receiving Money back by the same String by which they conveyed them." Q. "Do you speak of some Individuals, or all?" A. "Of some, which was the Case of some of those Prisoners that wanted Stockings when I was there." Q. "You have mentioned the Quantity of Cloaths allowed to the American Prisoners, I wish to know whether any Cloaths, and what Quantity, is allowed to the French and Spaniards?" Q. "Whether the Prisoners have been healthy or otherwise?" A. "Exceedingly so; I never saw Men look better; and the Number of Sick bears no Proportion to the Number confined." Q. "Do you know how many have died within these Three Years?" Q. "Out of how many?" A. "Six Hundred and Twenty-three, I think." Q. "Had they any contagious Distempers among them during that Period?" Q. "Had they not the Small Pox among them?" A. "They brought the Small Pox in among them; they inoculated themselves." Q. "They had the Small Pox during the Three Years you mentioned?" A. "Yes, it is Four Years." Q. "Out of how many did you mention that Number to have died?" A. "Out of Six Hundred and Twenty-three, or, I believe, it was Six Hundred and Thirty-one." Q. "Have they any Agent?" Q. "Do you know whether they have received any Assistance from any Persons that contributed to their Relief?" A. "I have heard there has been some voluntary Subscription sent them, but I don't know what the Amount is." Q. Do you know what that has been laid out in? Q. "Do you know what Allowance of Provision is given to Soldiers in Transports?" A. "Doctor Farquharson has the Paper of a Com parative View, he will inform your Lordships particularly about that, because there is an Account made, but it is inferior to what the Americans have, I am sure." Q. "You are sure it is inferior?" Q. "But you don't know what it is?" A. "The Particulars I don't recollect; but I know there is Half a Pound of Beef a Week less; but I have not the Memorandums of the Particulars about it." Q. "How often are these Prisoners visited?" A. "Once or Twice a Year, I believe." Q. "Whether they have not an Agent constantly on the Spot, whole Duty it is to visit the Prisoners constantly, and to report to their Board every Circumstance relating to them, and whether they want any Thing?" A. "Certainly, he makes a Report to our Board every Month of the State of the Prisons, and the Hospitals too." Q. "Whether you have any Memorandum or Minute taken at the Board in which there is an Account of what Cloathing the American Prisoners should have?" A. "Yes, I have a very accurate Account of the Money which has been expended and the Quantity of Cloaths which has been bought by that Money." Q. " That is not my Question: Whether there has been any Minute, any Order of your Board, directing what Quantity of Cloaths should be allowed to the American Prisoners?" Then a Paper, intituled, "An Extract of the Order of the Lords Commissioners of the Admiralty 6th of December 1777;" also, "Extract of a Letter to the Commissioners, Agents, Surgeon and Keeper of Mill Prison;" also, "An Extract of a Letter to the Commissioners, Agents, Surgeon and Keeper of Mill Prison, 30th January 1788," were produced and read. Q. "This Letter of the Admiralty mentions the Prisoners in certain Prisons, but this does not mention what Prison?" A. "Duplicates of the same Letters were sent to Forton as to Mill Prison." Q. "It mentions in each of the above mentioned Prisons, it does not mention what those Prisons were?" A. "Forton and Mill Prisons; we have no American Prisoners in any other Prisons." Q. "Are not other Prisoners supplied with Cloathing?" A. "Before any Commissioners were appointed for them, we supplied them with Cloaths, and when a March was ordered, we supplied them with Shoes; but when they came to be in a permanent State, the Agents of their respective Courts supplied them: Before Agents were appointed to judge of their Necessities we gave Cloathing to as many whose Necessities made it requisite." Q. "Do you do more than that for the Americans?" A. "We do it constantly and uniformly to the Americans, and have done so for Four Years." Q. "They have no Agents?" A. "We are their Agents." Q. "The Americans have no Agent to provide them with Cloathing?" Q. "And you therefore provide them with Cloathing at the Expence of Government?" Q. "And you do the same to French, Spaniards, and Dutch, till they have an Agent appointed to take Care of them?" Q. "Whether the Cloathing has been delivered at any particular Period?" A. "I have the Periods here at which they have been delivered." Q. "Be so good as to read them?" Q. "Have you any Account of what Cloathing has been provided for the French, the Spaniards, or the Dutch?" A. "It might be had, but I have it not upon me; it cannot be to any great Amount because it is only in the beginning; their Agents very soon afterwards took Charge of them, and provided what was wanted." Q. "Do you know what Allowance the Americans have of Bread?" A. "They have a Pound a Day." Q. "How much have the French, Spaniards, and Dutch?" A. "A Pound and Half." Q. "Do you know the Reason of that Difference?" A. 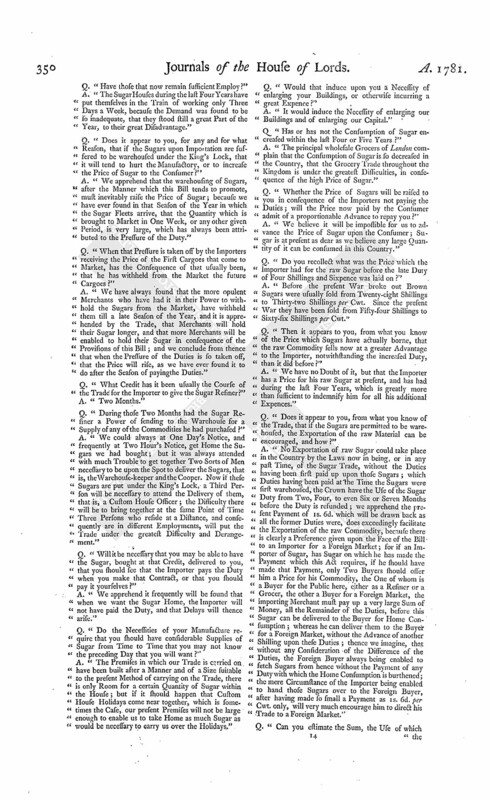 "I was not a Member of the Board when that Establishment first took place, but I know very well the Motives upon which they acted; it was considered what Quantity of Provisions was sufficient for Men in a State of Inaction; various Views presented themselves of Men in that State, the King's Troops aboard a Transport are in that State, the Rebel Prisoners in the Year 1745 were the same, and Prisoners of War, of which we had none at the Time; the Rebel Prisoners in 1745 seemed to have too little, the King's Troops on board the Transports their Allowance is rather scanty, and we gave the Americans more than either, though not so much as to the French Prisoners; when they came that was established by the Precedent of former Wars, and we could not break through it; when once the Precedent for the French Prisoners (fn. 3) were made, we were obliged to give them the same as France gave ours, and has been practised many Years in many different Wars." Q. "You have mentioned, that the Rebels in the Year 1745 had no more Allowance than One Pound of Bread is that what you mean to say?" A. "They had 4d. a Day allowed by Government, which was made to go as far as it could; it afforded a Pound of Bread, Half a Pound of Cheese, and a Quantity of Greens, without Beer." Q. "Was that deemed sufficient?" A. "I should imagine so, they had no more." Q. "Do you know any Men that have ever lived upon that Allowance for any Time together?" A. "Surely I do, great Numbers that have lived very well and in perfect Health." A. "In various Parts of the Country." Q. "That have lived upon Half a Pound of Bread a Day?" A. "And Half a Pound of Cheese; Men that don't labour." Q. "I thought you said that was deemed too little?" A. "We thought it rather too little, not but that a Man may live upon it, but it seems scanty." Q. "I should be glad you would explain the Difference, you thought it too little, but yet a Man might live upon it?" A. "They might exist undoubtedly, but yet might become emaciated by it." Q. "You said the Men in the King's Transports had less Bread a Day?" A. "I have it here exactly: Here is the Victualling of the American Prisoners compared with the King's Troops in Transports; the Americans in a Week have Two Pounds Six Ounces of Bread more; Meat they have Half a Pound more; Beer Two Gallons less, and the Reason of that is obvious, because they have nothing but Salt Provision, nor can have nothing else at Sea; Butter Three Ounces and a Half less; Cheese One Ounce and One Third more; Pease Five Sixths of a Pint more; Oatmeal none, nor Vinegar none; so that upon the Whole they have a greater Quantity of Food, and that of a much more nourishing Kind." Q. "With respect to Bread, you say the King's Troops have on board a Transport less Bread than the American Prisoners have in Prison?" A. "Yes, Two Pounds Six Ounces in a Week less." Q. "Do you mean Bread or Biscuit?" A. "I call both Bread; I apprehend they have nothing but Biscuit at Sea, they cannot have soft Bread at Sea." Q. "Then it is Biscuit?" Q. "Do you imagine that Biscuit is not more nourishing and will go farther than Bread?" A. "As it has less Moisture there may be some small Difference, very immaterial; I can't say I ever tried the Experiment; I speak from my Idea of it." Q. "When the King's Troops have that Allowance have not they their Pay besides?" Q. "If there is not in your Office some Account of the Reason of the French having more Bread than they originally had?" A. "Yes, we have that upon the Records of our Office." Q. "What was the Reason." A. "It was founded upon the Practice of the French to our Prisoners at the Request of the French Prisoners themselves, that, provided an Augmentation of Bread was allowed them, they would suffer a Diminution of the Quantity of their Meat, and they gave up a Quarter of a Pound of their Meat and they had Half a Pound of Bread more, which was nearly equivalent." Q. "I think you say the Americans now have Beer allowed them?" A. "Yes, a Quart a Day." Q. "Had the Rebel Prisoners in 1745 and 1746 any Beer allowed them?" Q. "Have the Prisoners made any Complaints to your Office of Want of Cloaths or Provisions?" A. "Never that I recollect, and I am pretty positive I should recollect if they had done it; I don't recollect any at all." Q. "Have they made any lately, within this Half Year?" A. "No, none; no Complaint at all, I am pretty certain they never did make any." Q. 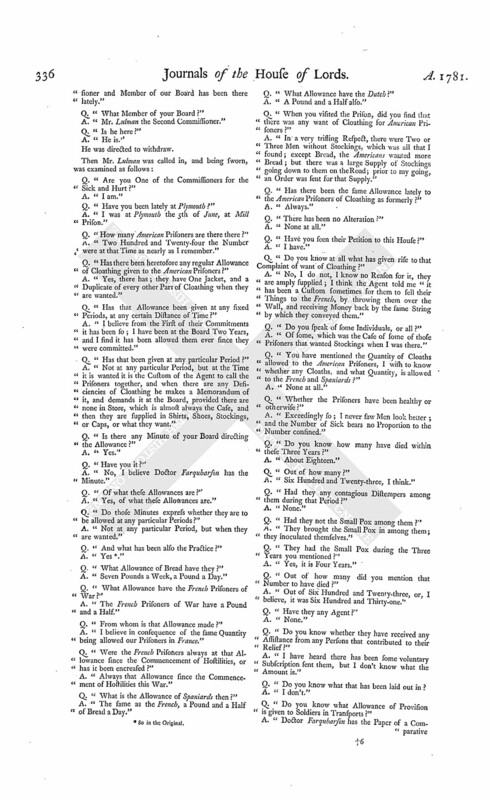 "Have you any Knowledge of what Allowance of Provisions is made to our Prisoners in France?" A. "Since this War has commenced we have received no particular Accounts of it, but I imagine, they must go by Precedents of last War as we do; and it is clear from the Books of our Office, that that was established by both Nations." Q. "So that one is a Precedent for the other?" Q. "I understand from you the French gave up a Quarter of a Pound of Meat for Half a Pound of Bread, was that in this War or the last?" A. "I think it was in the Year 1745." Q. "Do you mean that they gave up a Quarter of a Pound of Meat a Day?" Q. "Have the French Prisoners now a Quarter of a Pound of Meat per Day less than the American Prisoners?" A. "No, the Quantity of Meat is to both the same." Q. "So that American Prisoners have the same reduced Allowance the French have in Point of Meat, and a less Allowance by Two-thirds in Point of Bread?" A. "The Victualling is exactly the same, with the Difference of Half a Pound of Bread." Q. "Have you ever known the French Prisoners fell any Part of their Provisions?" A. "I really cannot tell; as to that the French eat a great Deal of Bread, they eat more Bread than our People considerably." Q. 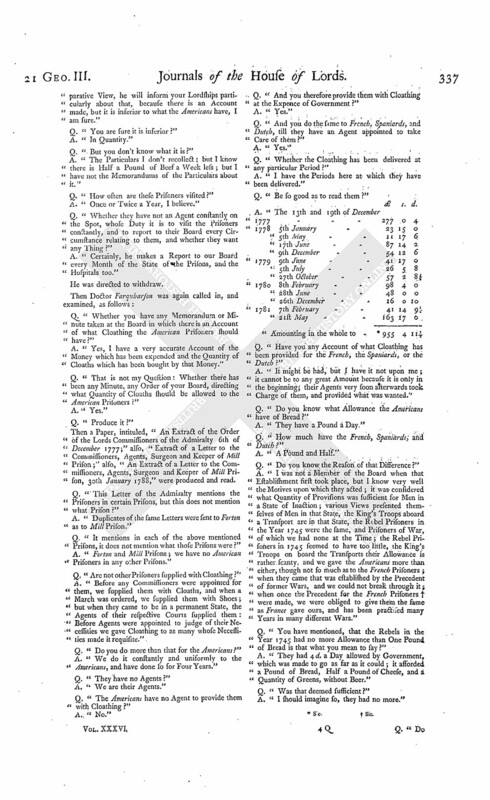 "What was the Allowance of the Rebel Prisoners in the Year 1745?" A. "A Pound of Bread, Half a Pound of Meat, and a Quarter of a Pound of Cheese; but to be more accurate, I will look to my Papers (refers to some Papers) it is exactly what I said, a Pound of Bread, Half a Pound of Meat, and a Quarter of a Pound of Cheese, without any Beer." Q. "I thought you said they had an Allowance of 4d. a Day?" A. "That was the Allowance made by Government, it was made to go as far as it could, and brought this Quantity." Q. "Was that Money laid out for them by the Commissioners of the Sick and Hurt, or were they allowed to lay it out themselves?" A. "It was laid out, I believe, by the Commissioners of Sick and Hurt, they had been employed to lay it out for them, and it fetched this Quantity." Q. "They were not allowed to lay it out themselves?" A. "No, they hardly could have any Opportunity of purchasing it themselves." Q. "Have you compared the Quantity that was allowed between the Rebel Prisoners in 1745, and the American Prisoners now?" Q. "And they are the same Quantity?" A. "Bread the same Quantity." Q. "Have they more Meat than the Rebels had in 1745?" A. "Compared with the Rebel Prisoners in 1745, they have per Week, Bread the same Quantity, Meat One Pound more, Beer One Gallon Three Quarts more, or the whole Quantity, Cheese One Pound Six Ounces less, Peas Two Pints more, or the whole Quantity." Q. "If you know what Species of Men the American Prisoners are that are confined in this Mill Prison, were they all taken in Arms, or any of them taken in trading?" A. "By Act of Parliament Men not taken in Arms are received on board the King's Ships, they are not deemed Prisoners at all, only those taken in Arms are committed." Q. "Those taken on board Privateers?" Motion for Address relative to, negatived. Then it was moved, "That an humble Address be presented to His Majesty, informing His Majesty of a Petition which has been presented to this House, signed by upwards of Two Hundred Americans in Behalf of themselves, and others now confined in the Mill Prison at Plymouth; in which is set forth, "That an Allowance of Cloathing which they have heretofore been supplied with from Government, hath for some Time past been discontinued, and that they have but Two Thirds of the Allowance of Bread, which is given to the Prisoners of France, Spain and Holland, from which Circumstances and from the Nature of their Commitment, and Want of an Agent, their Condition of Prisoners is peculiarly hard:" To inform His Majesty, that this House hath examined the Commissioners for sick and wounded Seamen, to whom, under the Board of Admiralty, the Management of the said Prisoners is entrusted, touching the said Complaint, and has found the same to be founded in Truth, so far as relates to the Allowance of Bread: To beseech His Majesty that He would be graciously pleased to give Orders, that the said Prisoners should no longer continue in a worse Condition as to Food than those of France, Spain, and Holland, and that they should receive such further Comforts and Indulgences as their respective Cases may deserve, and His Majesty, in His Royal Wisdom, shall think fit; fully convinced that such Acts of Humanity must ever be pleasing to His Majesty's generous Mind, and may be a powerful Means of reconciling the Hearts of the revolted Colonies to His Majesty's Government." Dominus Cancellarius declaravit præsens Parliamentum continuandum esse usque ad et in diem Martis, tertium diem instantis Julii, horâ undecimâ Auroræ, Dominis sic decernentibus. Viscount Mount Edgcumbe & Valletort. Ds. De Ferrars. With a Bill, intituled, "An Act to explain and amend so much of an Act made in the Twentieth Year of the Reign of His present Majesty, intituled, An Act to vest certain Messuages, Lands, Tenements, and Hereditaments, in Trustees, for the better securing His Majesty's Docks, Ships, and Stores, at Plymouth and Sheerness; and for better defending the Passage of the River Thames at Gravesend and Tilbury Fort," as relates to the Security of His Majesty's Docks, Ships, and Stores, at Plymouth;" to which they desire the Concurrence of this House. With a Bill, intituled, "An Act to prevent the Mischiefs that arise from driving Cattle within the Cities of London and Westminster, and Liberties thereof, and Bills of Mortality;" to which they desire the Concurrence of this House. Ordered, That the last mentioned Bill be printed. With a Bill, intituled, "An Act for the Relief of Insolvent Debtors; and for the Relief of Bankrupts in certain Cases;" to which they desire the Concurrence of this House. With a Bill, intituled, "An Act to explain and amend an Act made in the Eighth and Ninth Years of the Reign of King William the Third, intituled, An Act for the lessening the Duty upon Tin and Pewter exported, and granting an Equivalent for the same, by a Duty on Drugs," so far as the same relates to the Importation of Drugs from the Russian Dominions; and also an Act made in the Third Year of the Reign of His present Majesty, intituled, "An Act for the further Improvement of His Majesty's Revenue of Customs, and for the Encouragement of Officers making Seizures; and for the Prevention of the clandestine Running of Goods into any Part of His Majesty's Dominions," to permit the Importatation of Orchillia Weed and Cobalt during the present Hostilities, from any Place whatsoever, in British, Irish, or Neutral Ships; and to permit Sugars, the Growth of Demerary and Esequibo, to be imported into Great Britain, upon Payment of the like Duties and under the like Restrictions as Sugars of the British Islands in the West Indies;" to which they desire the Concurrence of this House. 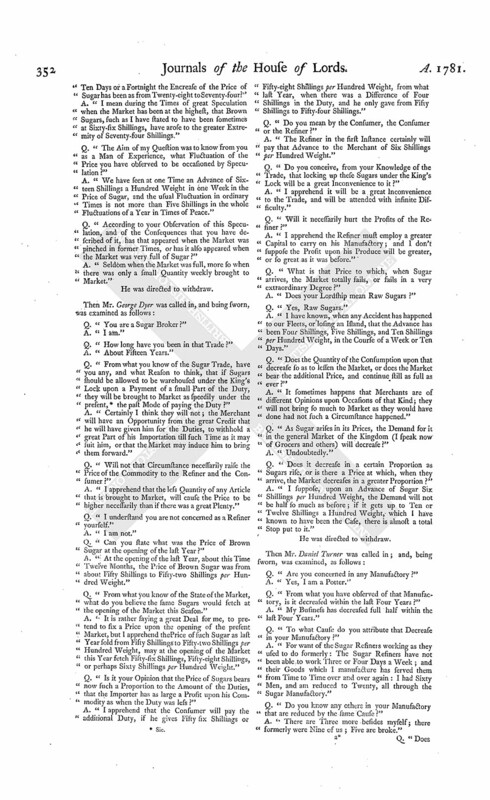 To return the Bill, intituled, "An Act to render valid certain Marriages solemnized in certain Churches and Public Chapels in which Banns had not usually been published before or at the Time of passing an Act made in the Twenty-sixth Year of King George the Second, intituled, "An Act for the better preventing of clandestine Marriages;" and to acquaint this House, That they have agreed to their Lordships Amendments made thereto. Lead, &c. to prevent dealing, Bill. 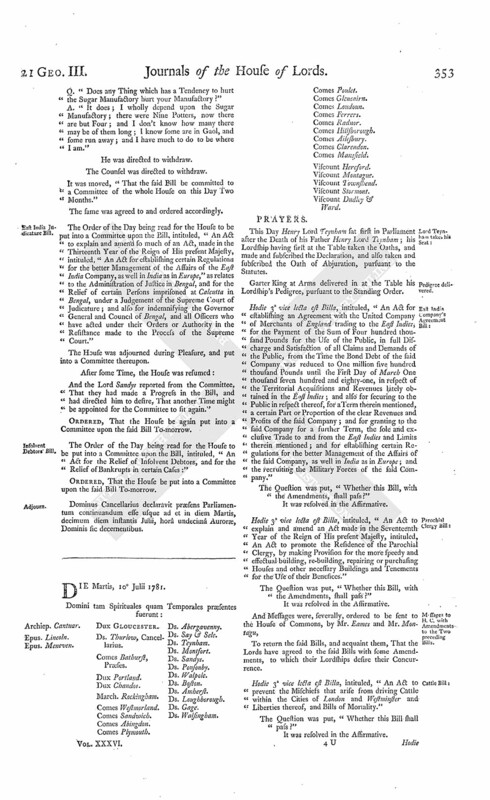 With a Bill, intituled, "An Act to explain and amend an Act made in the Fourth Year of the Reign of His late Majesty King George the Second, intituled, An Act for the more effectual punishing Stealers of Lead and Iron Bars fixed to Houses, or any Fences belonging thereunto;" to which they desire the Concurrence of this House. Pewter, &c. to prevent stealing, Bill. With a Bill, intituled, "An Act to explain and amend an Act made in the Twenty-ninth Year of the Reign of His late Majesty King George the Second, intituled, "An Act for more effectually discouraging and preventing the stealing and the buying and receiving of stolen Lead, Iron, Copper, Brass, Bell Metal, and Solder; and for more effectually bringing the Offenders to Justice;" to which they desire the Concurrence of this House. Ordered, That the said Bills be printed. Phillips's Powder, Letter of Commissioners of Victualling relative to, delivered. The House being informed, "That Mr. Jackson from the Admiralty Office attended:"
"Copy of a Letter from the Commissioners of the Victualling to Mr. Stephens, dated 8th December 1780, respecting Mr. Phillips's new invented Powder for destroying Vermin on board Ships." Ordered, That the said Letter do lie on the Table. The House (according to Order) was adjourned during Pleasure, and put into a Committee upon the Bill, intituled, "An Act for enabling His Majesty to raise the Sum of One Million, for the Uses and Purposes therein mentioned." And the Lord Sandys reported from the Committee, That they had gone through the Bill, and directed him to report the same to the House, without any Amendment." 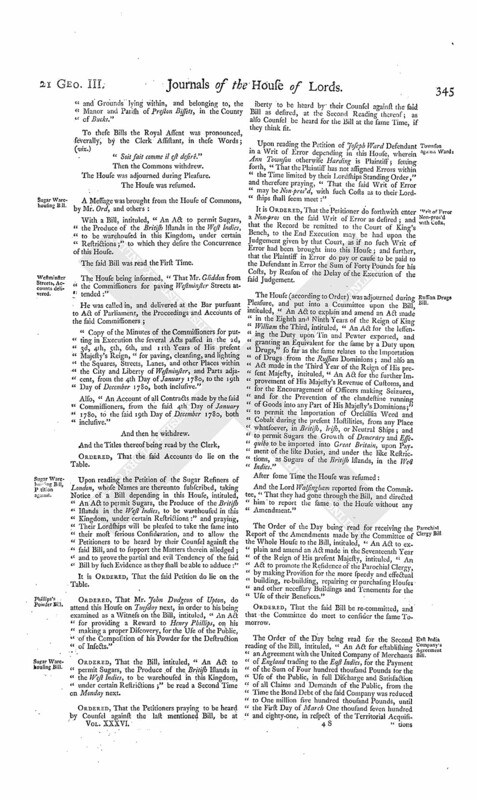 The House (according to Order) was adjourned during Pleasure, and put into a Committee upon the Bill, intituled, "An Act for granting to His Majesty a certain Sum of Money out of the Sinking Fund, and for applying certain Monies therein mentioned, for the Service of the Year One thousand seven hundred and eighty-one; and for further appropriating the Supplies granted in this Session of Parliament." And the Lord Sandys reported from the Committee, That they had gone through the Bill and directed him to report the same to the House, without any Amendment." The House (according to Order) was adjourned during Pleasure, and put into a Committee upon the Bill, intituled, "An Act for repealing the Duties payable upon Chocolate made in Great Britain, and for granting certain Inland Duties upon Cocoa Nuts in lieu thereof; for the better and more effectual securing the Revenue of Excise, and of the Inland Duties under the Management of the Commissioners of Excise, and for preventing Frauds therein; for the more punctual and ready Payment of the Allowances to be made to Brewers out of the additional Duties imposed on Malt; and for rectifying a Mistake in an Act made in this present Session of Parliament, with respect to the exempting of Candles from the additional Duty of Five Pounds per Centum upon the Duties of Excise imposed by the said Act." And the Lord Sandys reported from the Committee, That they had gone through the Bill, and directed him to report the same to the House without any Amendment." Thomson against Buchanan et al. Upon reading the Petition and Appeal of John Thomson Junior, Merchant, in Leith, complaining of an Interlocutor of the Lords of Session in Scotland, of the 20th of June 1781; and praying, "That the same may be reversed or varied, or that the Appellant may have such other Relief in the Premises, as to this House, in their Lordships great Wisdom, shall seem meet; and that George Buchanan, Robert Buchanan, John Robertson, Alexander Donald, Henry Ritchie, Robert Carrick, Alexander McCall, all Merchants, in Glasgow, and John Easdale Merchant, in Greenock, may be required to answer the said Appeal:"
It is Ordered, That the said George Buchanan, and the said several other Persons last named, may have a Copy of the said Appeal, and do put in their Answer or respective Answers thereunto, in Writing, on or before Tuesday the 31st of this Instant July; and Service of this Order upon the said Respondents, or upon any of their Counsel or Agents in the Court of Session in Scotland, shall be deemed good Service. East India Company's Agreement Bill. With a Bill, intituled, "An Act for establishing an Agreement with the United Company of Merchants of England, trading to the East Indies, for the Payment of the Sum of Four hundred thousand Pounds, for the Use of the Public; in full Discharge and Satisfaction of all Claims and Demands of the Public, from the Time the Bond Debt of the said Company was reduced to One million five hundred thousand Pounds, until the First Day of March One thousand seven hundred and eighty-one, in respect of the Territorial Acquisitions and Revenues lately obtained in the East Indies; and also for securing to the Public in respect thereof, for a Term therein mentioned, a certain Part or Proportion of the clear Revenues and Profits of the said Company; and for granting to the said Company, for a further Term, the sole and exclusive Trade to and from the East Indies, and Limits therein mentioned; and for establishing certain Regulations for the better Management of the Affairs of the said Company, as well in India as in Europe; and the Recruiting the Military Forces of the said Company;" to which they desire the Concurrence of this House. Ordered, That the said Bill be read a Second Time on Thursday next; and that the Lords be summoned. The House was adjourned during Pleasure, and put into a Committee thereupon. And the Lord Sandys reported from the Committee, That they had made a further Progress in the Bill, and had directed him to desire, "That another Time might be appointed for the Committee to fit again." Ordered, That the House be again put into a Committee to consider further of the said Bill on Tuesday the 10th of this Instant July. Ordered, That Mr. Shields, Nursery Man, do attend this House on Tuesday the 10th of this Instant July, in order to his being examined as a Witness upon the said Bill. Commissioners of Victualling, &c. to attend. Ordered, That the Commissioners of the Victualling Office do attend this House on Tuesday the 10th of this Instant July, in order to their being examined in relation to the said Bill. Ordered, That the Bill, intituled, "An Act to explain and amend so much of an Act made in the Thirteenth Year of the Reign of His present Majesty, intituled, An Act for establishing certain Regulations for the better Management of the Affairs of the East India Company, as well in India as in Europe, as relates to the Administration of Justice in Bengal; and for the Relief of certain Persons imprisoned at Calcutta in Bengal, under a Judgment of the Supreme Court of Judicature; and also for indemnisying the Governor General and Counsel of Bengal, and all Officers who have acted under their Orders or Authority in the Resistance made to the Process of the Supreme Court," be read a Second Time on Friday next; and that the Lords be summoned. Chalmer to enter into Recognizance on Thomson's Appeal. The House being moved, "That James Chalmer, of Leicester Fields, Gentleman, may be permitted to enter into a Recognizance for John Thomson Merchant, on account of his Appeal depending in this House, he living in Scotland:"
Dominus Cancellarius declaravit præsens Parliamentum continuandum esse usque ad et in diem Mercurii, quartum diem instantis Julii, horâ undecimâ Auroræ, Dominis sic decernentibus. Viscount Mount Edgcumbe & Valletort. Ds. Say & Sele. Hodie 3a vice lecta est Billa, intituled, "An Act for enabling His Majesty to raise the Sum of One Million, for the Uses and Purposes therein mentioned." 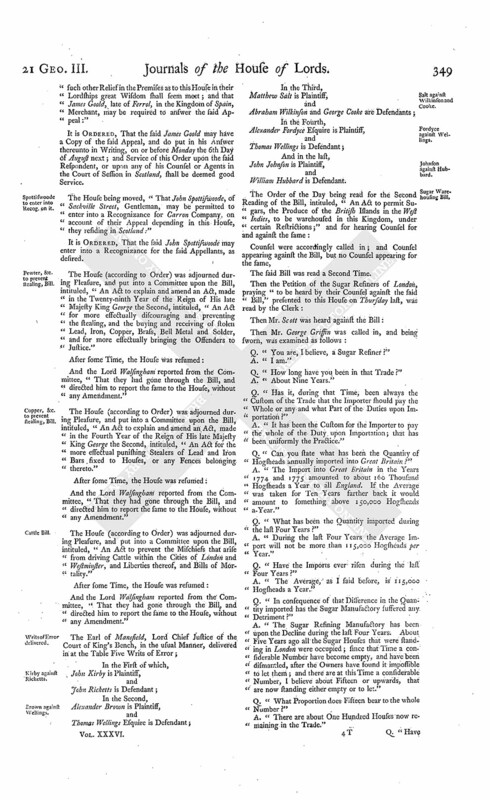 Hodie 3a vice lecta est Billa, intituled, "An Act for granting to His Majesty a certain Sum of Money out of the Sinking Fund; and for applying certain Monies therein mentioned for the Service of the Year One thousand seven hundred and eighty-one; and for further appropriating the Supplies granted in this Session of Parliament." Hodie 3a vice lecta est Billa, intituled, "An Act for repealing the Duties payable upon Chocolate made in Great Britain, and for granting certain Inland Duties upon Cocoa Nuts in lieu thereof; for the better and more effectual securing the Revenue of Excise, and of the Inland Duties under the Management of the Commissioners of Excise, and for preventing Frauds therein; for the more punctual and ready Payment of the Allowances to be made to Brewers out of the additional Duties imposed on Malt; and for rectifying a Mistake in an Act made in this present Session of Parliament, with respect to the exempting of Candles from the additional Duty of Five Pounds per Centum upon the Duties of Excise imposed by the said Act." Hodie 2a vice lecta est Billa, intituled, "An Act to explain and amend so much of an Act, made in the Twentieth Year of the Reign of His present Majesty, intituled, "An Act to vest certain Messuages, Lands, Tenements and Hereditaments in Trustees, for the better securing His Majesty's Docks, Ships and Stores at Plymouth and Sheerness, and for better defending the Passage of the River Thames at Gravesend and Tilbury Fort, as relates to the Security of His Majesty's Docks, Ships and Stores at Plymouth." Ordered, That the House be put into a Committee upon the said Bill on Friday next. Hodie 2a vice lecta est Billa, intituled, "An Act to explain and amend an Act, made in the Eighth and Ninth Years of the Reign of King William the Third, intituled, "An Act for the lessening the Duty upon Tin and Pewter exported, and granting an Equivalent for the same by a Duty on Drugs", so far as the same relates to the Importation of Drugs from the Russian Dominions; and also an Act made in the Third Year of the Reign of His present Majesty, intituled, "An Act for the further Improvement of His Majesty's Revenue of Customs, and for the Encouragement of Officers making Seizures, and for the Prevention of the clandestine Running of Goods into any Part of His Majesty's Dominions;" to permit the Importation of Orchillia Weed and Cobalt, during the present Hostilities, from any Place whatsoever, in British, Irish, or Neutral Ships; and to permit Sugars, the Growth of Demerary and Essequibo, to be imported into Great Britain, upon Payment of the like Duties, and under the like Restrictions, as Sugars of the British Islands in the West Indies." Bank Buildings Bill, King's Consent to it. The Lord Chancellor acquainted the House, "That His Majesty having been informed of the Contents of the Bill, intituled, "An Act for vesting the Parish Church of Saint Christopher le Stocks, in the City of London, and the Materials and Scite thereof, and the Church Yard thereto adjoining, in the Governor and Company of the Bank of England, and their Successors, for ever, and for uniting the said Parish to the Parish of Saint Margaret Lothbury, in the said City," was pleased to consent, (as far as His Majesty's Interest is concerned) That their Lordships may proceed therein as they shall think fit." Hodie 2a vice lecta est Billa, intituled, "An Act for vesting the Parish Church of Saint Christopher le Stocks, in the City of London, and the Materials and Scite thereof, and the Church Yard thereto adjoining, in the Governor and Company of the Bank of England, and their Successors, for ever, and for uniting the said Parish to the Parish of Saint Margaret Lothbury, in the said City." L. Bp. St. Davids. L. Say & Sele. Their Lordships or any Five of them, to meet To-morrow, at Ten o'Clock in the Forenoon, in the Prince's Lodgings, near the House of Peers; and to adjourn as they please. 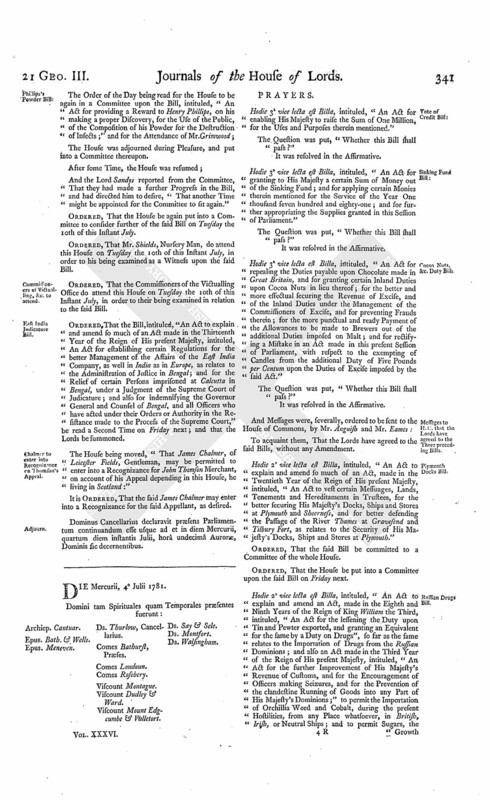 The House (according to Order) was adjourned during Pleasure, and put into a Committee upon the Bill, intituled, "An Act to explain and amend an Act, made in the Seventeenth Year of the Reign of His present Majesty, intituled, "An Act to promote the Residence of the Parochial Clergy, by making Provision for the more speedy and effectual building, rebuilding, repairing or purchasing Houses, and other necessary Buildings and Tenements for the Use of their Benefices." And the Lord Walsingham reported from the Committee, "That they had gone through the Bill, and made some Amendments thereto, which he was ready to report, when the House will please to receive the same." Dominus Cancellarius declaravit præsens Parliamentum continuandum esse usque ad et in diem Jovis, quintum diem instantis Julii, horâ undecimâ Auroræ, Dominis sic decernentibus. Viscount Dudley & Ward. Ds. Abergavenny. Then Three of the Lords Commissioners, being in their Robes, and seated on a Form placed between the Throne and the Woolsack, the Lord Chancellor in the Middle, with the Archbishop of Canterbury on his Right Hand, and the Lord Amherst on his Left; commanded the Gentleman Usher of the Black Rod to signify to the Commons, "The Lords Commissioners desire their immediate Attendance in this House, to hear the Commission read." "His Majesty not thinking fit to be personally present here at this Time, has been pleased to cause a Commission to be issued under the Great Seal, and thereby given His Royal Assent to divers Acts, which have been agreed upon by both Houses of Parliament, the Titles whereof are particularly mentioned; and by the said Commission hath commanded Us to declare and notify His Royal Assent to the said several Acts, in the Presence of you the Lords and Commons assembled for that Purpose; which Commission you will now hear read." George the Third, by the Grace of God, of Great Britain, France and Ireland, King, Defender of the Faith, and so forth: To Our Right Trusty and Right Well-beloved the Lords Spiritual and Temporal, and to Our Trusty and Well-beloved the Knights, Citizens and Burgesses, and the Commissioners for Shires and Burghs of the House of Commons, in this present Parliament assembled, Greeting, Whereas, We have seen and perfectly understood divers and sundry Acts agreed and accorded on by you Our loving Subjects, the Lords Spiritual and Temporal, and the Commons, in this Our present Parliament assembled, and endorsed by you as hath been accustomed, the Titles and Names of which Acts hereafter do particularly ensue, (that is to say) "An Act for enabling His Majesty to raise the Sum of One Million, for the Uses and Purposes therein mentioned." "An Act for granting to His Majesty a certain Sum of Money out of the Sinking Fund; and for applying certain Monies therein mentioned, for the Service of the Year One thousand seven hundred and eighty-one; and for further appropriating the Supplies granted in this Session of Parliament." "An Act for establishing an Agreement with the Governor and Company of the Bank of England, for advancing the Sum of Two Millions towards the Supply for the Service of the Year One thousand seven hundred and eighty-one." "An Act to direct the Payment into the Exchequer of the respective Balances remaining in the Hands of the several Persons therein named, for the Use and Benefit of the Public, and for indemnifying the said respective Persons, and their Representatives, in respect of such Payments, and against all future Claims relating thereto, and for other Purposes therein mentioned." "An Act for repealing the Duties payable upon Chocolate made in Great Britain, and for granting certain Inland Duties upon Cocoa Nuts in lieu thereof; for the better and more effectual securing the Revenue of Excise, and of the Inland Duties under the Management of the Commissioners of Excise, and for preventing Frauds therein; for the more punctual and ready Payment of the Allowances to be made to Brewers out of the additional Duties imposed on Malt; and for rectifying a Mistake in an Act made in this present Session of Parliament with respect to the exempting of Candles from the additional Duty of Five Pounds per Centum upon the Duties of Excise imposed by the said Act." "An Act for granting to His Majesty an additional Duty upon Almanacks printed on one Side of any one Sheet or Piece of Paper; and for allowing a certain annual Sum out of the said Duty to each of the Universities of Oxford and Cambridge, in lieu of the Money heretofore paid to the said Universities, by the Company of Stationers of the City of London, for the Privilege of printing Almanacks." "An Act for rendering more effectual so much of an Act, made in the Tenth Year of His Majesty's Reign, intituled, "An Act for appropriating a Fund, established by an Act made in the Seventh Year of the Reign of His present Majesty, for granting to His Majesty additional Duties on certain foreign Linens imported into this Kingdom, and for establishing a Fund for the encouraging of the raising and dressing of Hemp and Flax," as relates to the distributing and paying the Proportion of the Fund thereby appropriated for the Encouragement of the Growth of Hemp and Flax in that Part of Great Britain called England, by applying a Sum, not exceeding Fifteen thousand Pounds per Annum, out of the said Arrears and Duties, to the Purposes aforesaid, for a Time limited." "An Act for continuing the Encouragement and Reward of Persons making certain Discoveries for finding the Longitude at Sea, or making other useful Discoveries and Improvements in Navigation, and for making Experiments relating thereto." 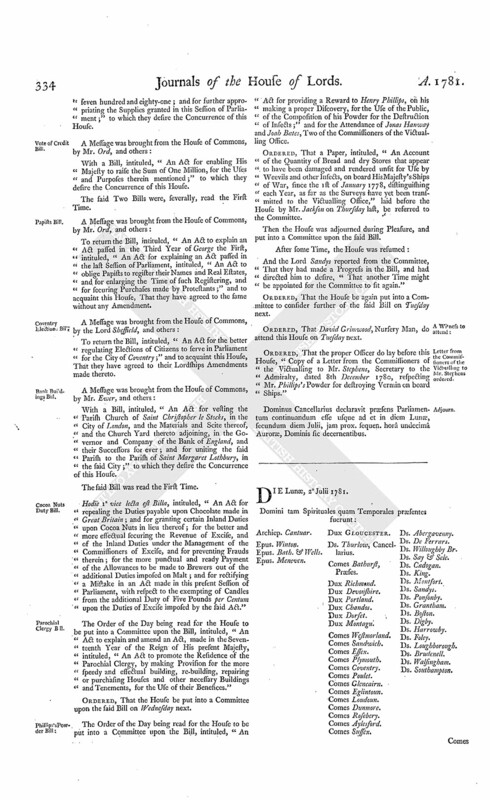 "An Act to explain an Act passed in the Third Year of George the First, intituled, "An Act for explaining an Act passed in the last Session of Parliament, intituled, "An Act to oblige Papists to register their Names and Real Estates, and for enlarging the Time of such registering, and for securing Purchases made by Protestants." 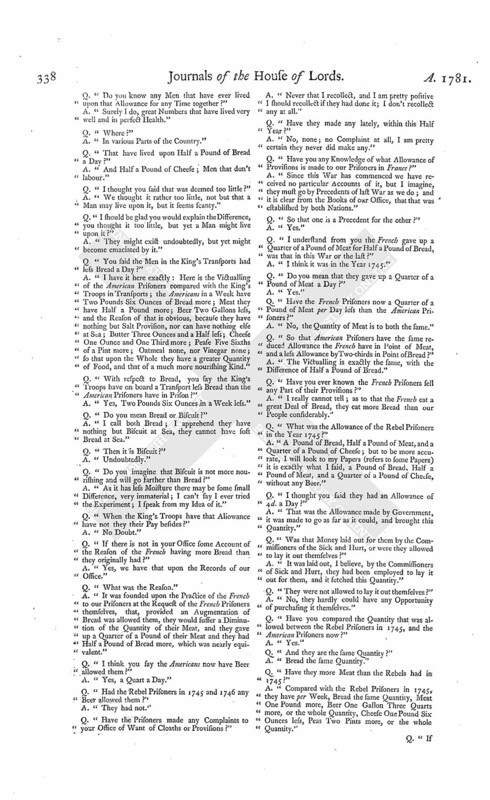 "An Act to render valid certain Marriages solemnized-in certain Churches and public Chapels in which Banns had not usually been published before or at the Time of passing an Act made in the Twenty-sixth Year of King George the Second, intituled, "An Act for the better preventing of clandestine Marriages." "An Act for the better regulating Elections of Citizens to serve in Parliament for the City of Coventry." "An Act for erecting a new Gaol, and for removing certain Gateways in the City of Gloucester, and for amending the several Acts passed for the Maintenance and Support of the Poor of the said City, and lighting, paving and regulating the Streets there." "An Act for more effectually repairing the Road from the Dun Cow, in the Town of Dunchurch, to the Town of Hillmorton, in the County of Warwick, and from thence to Saint James's End, in the Parish of Duston, in the County of Northampton; and for repealing the several Laws now in force relating to the said Road." "An Act for dividing and enclosing certain Commons and Waste Grounds, within the Parish of Hanbury, in the County of Worcester." " An Act for dividing and enclosing the Open and Common Fields, Meadows, Pastures and other Commonable Land within the Manor and Parish of Kington, in the County of Worcester." "An Act for dividing and enclosing the Open and Common Field, and other Commonable Lands and Grounds lying within and belonging to the Manor and Parish of Preston Bissett, in the County of Bucks." And albeit the said Acts by you Our said Subjects the Lords and Commons in this Our present Parliament assembled, are fully agreed and consented unto, yet nevertheless the same are not of Force and Effect in the Law without Our Royal Assent given and put to the said Acts; and forasmuch as for divers Causes and Considerations, We cannot conveniently at this Time be present in Our Royal Person in the Higher House of Our said Parliament, being the Place accustomed to give Our Royal Assent to such Acts as have been agreed upon by you Our said Subjects the Lords and Commons, We have therefore caused these Our Letters Patent to be made, and have signed the same; and by the same do give and put Our Royal Assent to the said Acts, and to all Articles, Clauses, and Provisions therein contained, and have fully agreed and assented to the said Acts; Willing that the said Acts, and every Article, Clause, Sentence and Provision therein contained, from henceforth shall be of the same Strength, Force and Effect, as if We had been personally present in the said Higher House, and had openly and publickly in the Presence of you all assented to the same: And We do by these Presents declare and notify the same Our Royal Assent, as well to you the Lords Spiritual and Temporal, and Commons aforesaid, as to all others whom it may concern: Commanding also, by these Presents, Our right trusty and Well-beloved Counsellor Edward Lord Thurlow, Our Chancellor of Great Britain, to seal these Our Letters Patent with Our Great Seal of Great Britain; And also, commanding the most Reverend Father in God, Our right trusty and Well-beloved Counsellor Frederick Archbishop of Canterbury, Primate and Metropolitan of all England; Our said Chancellor of Great Britain; Our right trusty and right Well-beloved Cousins and Counsellors Henry Earl Bathurst, President of Our Council; William Earl of Dartmouth, Keeper of Our Privy Seal; Our right trusty and right entirely beloved Cousins and Counsellors Augustus Henry Duke of Grafton, Thomas Duke of Leeds, Hugh Duke of Northumberland, Our right trusty and right Well-beloved Cousins and Counsellors William Earl Talbot, Steward of Our Household; Francis Seymour Earl of Hertford, Chamberlain of Our Household; John Earl of Sandwich, First Commissioner of Our Admiralty; Frederick Earl of Carlisle, William Henry Earl of Rochford, Hugh Earl of Marchmont, John Earl of Ashburnham, Groom of Our Stole; Wills Earl of Hillsborough, One of Our Principal Secretaries of State; William Earl of Mansfield, Our Chief Justice assigned to hold Pleas before Us; Our right trusty and Well-beloved Cousins and Counsellors George Viscount Townshend, Thomas Viscount Weymouth, David Viscount Stormont, One other of Our Principal Secretaries of State; and Our right trusty and Well-beloved Counsellor Jeffery Lord Amherst, or any Three or more of them, to declare and notify this Our Royal Assent, in Our Absence in the said Higher House, in the Presence of you the said Lords and the Commons of Our Parliament, there to be assembled for that Purpose; and the Clerk of Our Parliaments to endorse the said Acts with such Terms and Words, in Our Name, as is requisite, and hath been accustomed for the same, and also to enroll these Our Letters Patent and the said Acts in the Parliament Roll; and these Our Letters Patent shall be to every of them, a sufficient Warrant in that Behalf: And finally, We do declare and will, that after this Our Royal Assent given and passed by these presents, and declared and notified as is aforesaid, then and immediately the said Acts shall be taken, accepted and admitted good, sufficient, and perfect Acts of Parliament, and Laws, to all Intents, Constructions and Purposes, and to be put in due Execution accordingly; the Continuance or Dissolution of this Our Parliament, or any other Use, Custom, Thing or Things to the contrary thereof notwithstanding. In Witness whereof, We have caused these Our Letters to be made Patent. Witness Ourself at Westminster, the Fifth Day of July in the Twenty-first Year of Our Reign. 1. "An Act for enabling His Majesty to raise the Sum of One Million, for the Uses and Purposes therein mentioned." 2. "An Act for granting to His Majesty a certain Sum of Money out of the Sinking Fund, and for applying certain Monies therein mentioned for the Service of the Year One thousand seven hundred and eighty one, and for further appropriating the Supplies granted in this Session of Parliament." 3. "An Act for establishing an Agreement with the Governor and Company of the Bank of England, for advancing the Sum of Two Millions, towards the Supply for the Service of the Year One thousand seven hundred and eighty-one." 4. 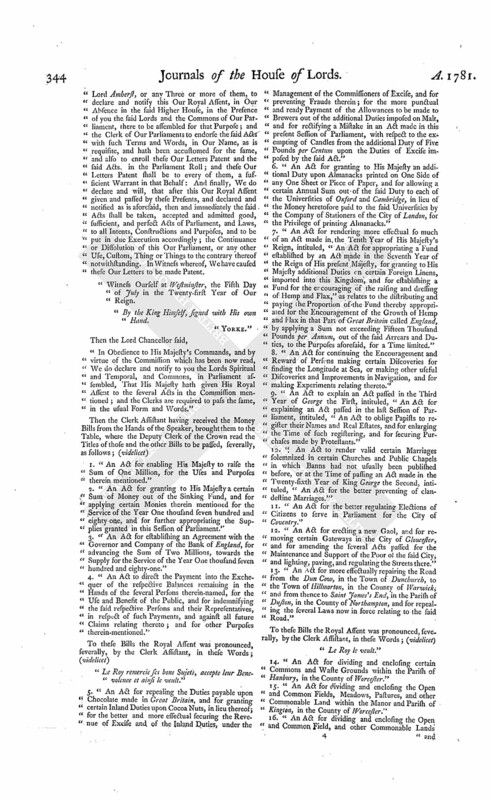 "An Act to direct the Payment into the Exchequer of the respective Balances remaining in the Hands of the several Persons therein-named, for the Use and Benefit of the Public, and for indemnifying the said respective Persons and their Representatives, in respect of such Payments, and against all future Claims relating thereto; and for other Purposes therein-mentioned." "Le Roy remercie ses bons Sujets, accepte leur Benevolence et ainsi le veult." 5. "An Act for repealing the Duties payable upon Chocolate made in Great Britain, and for granting certain Inland Duties upon Cocoa Nuts, in lieu thereof; for the better and more effectual securing the Revenue of Excise and of the Inland Duties, under the Management of the Commissioners of Excise, and for preventing Frauds therein; for the more punctual and ready Payment of the Allowances to be made to Brewers out of the additional Duties imposed on Malt, and for rectifying a Mistake in an Act made in this present Session of Parliament, with respect to the exempting of Candles from the additional Duty of Five Pounds per Centum upon the Duties of Excise imposed by the said Act." 6. "An Act for granting to His Majesty an additional Duty upon Almanacks printed on One Side of any One Sheet or Piece of Paper, and for allowing a certain Annual Sum out of the said Duty to each of the Universities of Oxford and Cambridge, in lieu of the Money heretofore paid to the said Universities by the Company of Stationers of the City of London, for the Privilege of printing Almanacks." 7. "An Act for rendering more effectual so much of an Act made in the Tenth Year of His Majesty's Reign, intituled, "An Act for appropriating a Fund established by an Act made in the Seventh Year of the Reign of His present Majesty, for granting to His Majesty additional Duties on certain Foreign Linens, imported into this Kingdom, and for establishing a Fund for the encouraging of the raising and dressing of Hemp and Flax," as relates to the distributing and paying the Proportion of the Fund thereby appropriated for the Encouragement of the Growth of Hemp and Flax in that Part of Great Britain called England, by applying a Sum not exceeding Fifteen Thousand Pounds per Annum, out of the said Arrears and Duties, to the Purposes aforesaid, for a Time limited." 8. "An Act for continuing the Encouragement and Reward of Persons making certain Discoveries for finding the Longitude at Sea, or making other useful Discoveries and Improvements in Navigation, and for making Experiments relating thereto." 9. 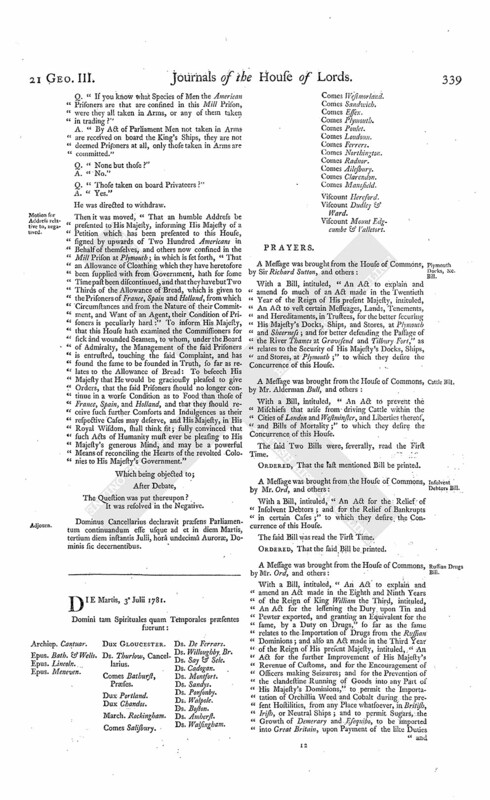 "An Act to explain an Act passed in the Third Year of George the First, intituled, "An Act for explaining an Act passed in the last Session of Parliament, intituled, "An Act to oblige Papists to register their Names and Real Estates, and for enlarging the Time of such registering, and for securing Purchases made by Protestants." 10. "An Act to render valid certain Marriages solemnized in certain Churches and Public Chapels in which Banns had not usually been published before, or at the Time of passing an Act made in the Twenty-sixth Year of King George the Second, intituled, "An Act for the better preventing of clandestine Marriages." 11. "An Act for the better regulating Elections of Citizens to serve in Parliament for the City of Coventry." 12. "An Act for erecting a new Gaol, and for removing certain Gateways in the City of Gloucester, and for amending the several Acts passed for the Maintenance and Support of the Poor of the said City, and lighting, paving, and regulating the Streets there." 13. "An Act for more effectually repairing the Road from the Dun Cow, in the Town of Dunchurch, to the Town of Hillmorton, in the County of Warwick, and from thence to Saint James's End, in the Parish of Duston, in the County of Northampton, and for repealing the several Laws now in force relating to the said Road." 14. "An Act for dividing and enclosing certain Commons and Waste Grounds within the Parish of Hanbury, in the County of Worcester." 15. "An Act for dividing and enclosing the Open and Common Fields, Meadows, Pastures, and other Commonable Land within the Manor and Parish of Kington, in the County of Worcester." 16. "An Act for dividing and enclosing the Open and Common Field, and other Commonable Lands and Grounds lying within, and belonging to, the Manor and Parish of Preston Bissett, in the County of Bucks." With a Bill, intituled, "An Act to permit Sugars, the Produce of the British Islands in the West Indies, to be warehoused in this Kingdom, under certain Restrictions;" to which they desire the Concurrence of this House. The House being informed, "That Mr. Gliddon from the Commissioners for paving Westminster Streets attended:"
"Copy of the Minutes of the Commissioners for putting in Execution the several Acts passed in the 2d, 3d, 4th, 5th, 6th, and 11th Years of His present Majesty's Reign, "for paving, cleansing, and lighting the Squares, Streets, Lanes, and other Places within the City and Liberty of Westminster, and Parts adjacent, from the 4th Day of January 1780, to the 19th Day of December 1780, both inclusive." Also, "An Account of all Contracts made by the said Commissioners, from the said 4th Day of January 1780, to the said 19th Day of December 1780, both inclusive." Sugar Warehousing Bill, Petition against. Upon reading the Petition of the Sugar Refiners of London, whose Names are thereunto subscribed, taking Notice of a Bill depending in this House, intituled, An Act to permit Sugars, the Produce of the British Islands in the West Indies, to be warehoused in this Kingdom, under certain Restrictions:" and praying, Their Lordships will be pleased to take the same into their most serious Consideration, and to allow the Petitioners to be heard by their Counsel against the said Bill, and to support the Matters therein alledged; and to prove the partial and evil Tendency of the said Bill by such Evidence as they shall be able to adduce:"
Ordered, That Mr. John Dudgeon of Upton, do attend this House on Tuesday next, in order to his being examined as a Witness on the Bill, intituled, "An Act for providing a Reward to Henry Phillips, on his making a proper Discovery, for the Use of the Public, of the Composition of his Powder for the Destruction of Insects." Ordered, That the Bill, intituled, "An Act to permit Sugars, the Produce of the British Islands in the West Indies, to be warehoused in this Kingdom, under certain Restrictions;" be read a Second Time on Monday next. Ordered, That the Petitioners praying to be heard by Counsel against the last mentioned Bill, be at liberty to be heard by their Counsel against the said Bill as desired, at the Second Reading thereof; as also Counsel be heard for the Bill at the same Time, if they think fit. Upon reading the Petition of Joseph Ward Defendant in a Writ of Error depending in this House, wherein Ann Townson otherwise Harding is Plaintiff; setting forth, "That the Plaintiff has not assigned Errors within the Time limited by their Lordships Standing Order," and therefore praying, "That the said Writ of Error may be Non pros'd, with such Costs as to their Lordships shall seem meet:"
Writ of Error Non-pros'd with Costs. It is Ordered, That the Petitioner do forthwith enter a Non-pros on the said Writ of Error as desired; and that the Record be remitted to the Court of King's Bench, to the End Execution may be had upon the Judgement given by that Court, as if no such Writ of Error had been brought into this House; and further, that the Plaintiff in Error do pay or cause to be paid to the Defendant in Error the Sum of Forty Pounds for his Costs, by Reason of the Delay of the Execution of the said Judgement. The House (according to Order) was adjourned during Pleasure, and put into a Committee upon the Bill, intituled, " An Act to explain and amend an Act made in the Eighth and Ninth Years of the Reign of King William the Third, intituled, "An Act for the lessening the Duty upon Tin and Pewter exported, and granting an Equivalent for the same by a Duty upon Drugs," so far as the same relates to the Importation of Drugs from the Russian Dominions; and also an Act made in the Third Year of the Reign of His present Majesty, intituled, "An Act for the further Improvement of His Majesty's Revenue of Customs, and for the Encouragement of Officers making Seizures, and for the Prevention of the clandestine running of Goods into any Part of His Majesty's Dominions;" to permit the Importation of Orchillia Weed and Cobalt during the present Hostilities, from any Place whatsoever, in British, Irish, or Neutral Ships; and to permit Sugars the Growth of Demerary and Essequibo to be imported into Great Britain, upon Payment of the like Duties, and under the like Restrictions, as Sugars of the British Islands, in the West Indies." And the Lord Walsingham reported from the Committee, "That they had gone through the Bill, and directed him to report the same to the House without any Amendment." 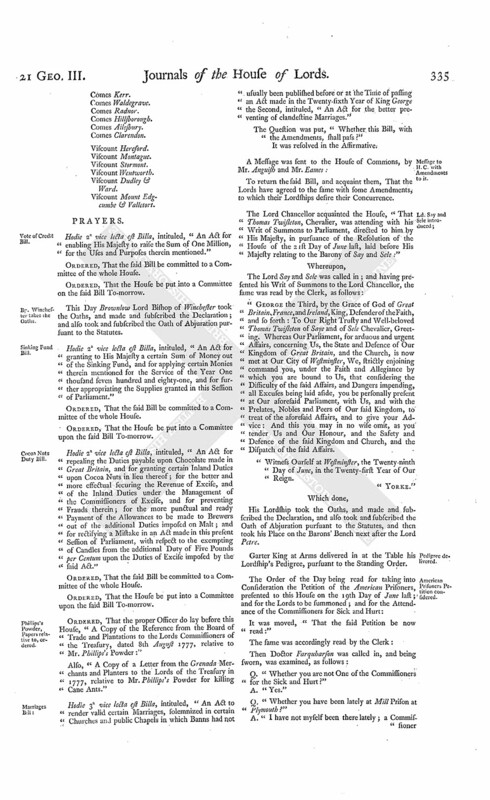 The Order of the Day being read for receiving the Report of the Amendments made by the Committee of the Whole House to the Bill, intituled, "An Act to explain and amend an Act made in the Seventeenth Year of the Reign of His present Majesty, intituled, "An Act to promote the Residence of the Parochial Clergy, by making Provision for the more speedy and effectual building, re-building, repairing or purchasing Houses and other necessary Buildings and Tenements for the Use of their Benefices." Ordered, That the said Bill be re-committed, and that the Committee do meet to consider the same Tomorrow. It was moved, "That the said Bill be now read a Second Time." Then the said Bill was accordingly read a Second Time. Dominus Cancellarius declaravit præsens Parliamentum continuandum esse usque ad et in diem Veneris, sextum diem instantis Julii, horâ undecimâ Auroræ, Dominis sic decernentibus. Viscount Mount Edgcumbe & Valletort. Ds. Willoughby Br. Ld. Grosvenor takes the Oaths. This Day Robert Lord Grosvenor took the Oaths, and made and subscribed the Declaration, and also took and subscribed the Oath of Abjuration, pursuant to the Statutes. The Earl of Radnor reported from the Lords Committees, to whom the Bill, intituled, "An Act for vesting the Parish Church of Saint Christopher le Stocks, in the City of London, and the Materials and Scite thereof, and the Church Yard thereto adjoining, in the Governor and Company of the Bank of England, and their Successors for ever; and for uniting the said Parish to the Parish of Saint Margaret Lothbury, in the said City," was committed: "That they had considered the said Bill, and examined the Allegations thereof, which were found to be true; and that the Committee had gone through the Bill, and made some Amendments thereto." L. 38. and 39. Leave out ("as far as the same will extend"). And the said Amendments being read a Second Time, were, severally, agreed to by the House. Marriage Act; Bill to amend. Ordered, That the Bill, intituled, "An Act to amend an Act made in the Twenty-sixth Year of the Reign of His late Majesty King George the Second, intituled, "An Act for the better preventing of clandestine Marriages; and for removing Doubts with respect to certain Marriages therein mentioned," be read a Second Time on Thursday next; and that the Lords be summoned. 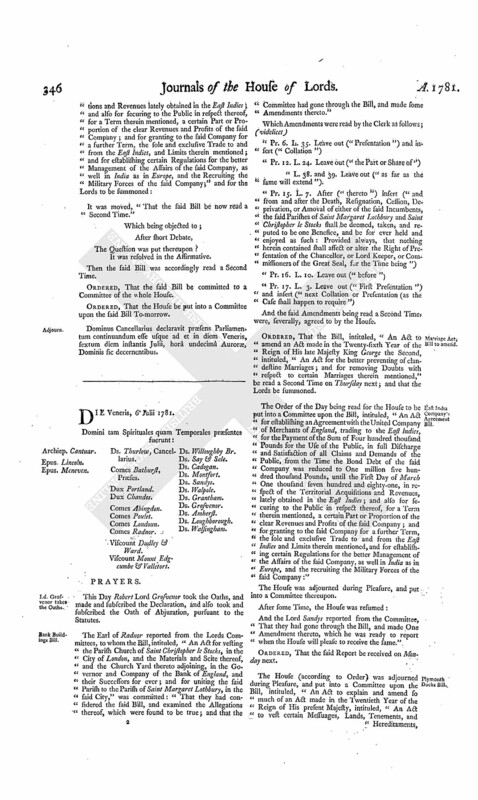 The Order of the Day being read for the House to be put into a Committee upon the Bill, intituled, "An Act for establishing an Agreement with the United Company of Merchants of England, trading to the East Indies, for the Payment of the Sum of Four hundred thousand Pounds for the Use of the Public, in full Discharge and Satisfaction of all Claims and Demands of the Public, from the Time the Bond Debt of the said Company was reduced to One million five hundred thousand Pounds, until the First Day of March One thousand seven hundred and eighty-one, in respect of the Territorial Acquisitions and Revenues, lately obtained in the East Indies; and also for securing to the Public in respect thereof, for a Term therein, mentioned, a certain Part or Proportion of the clear Revenues and Profits of the said Company; and for granting to the said Company for a further Term, the sole and exclusive Trade to and from the East Indies and Limits therein mentioned, and for establishing certain Regulations for the better Management of the Affairs of the said Company, as well in India as in Europe, and the recruiting the Military Forces of the said Company:"
And the Lord Sandys reported from the Committee, That they had gone through the Bill, and made One Amendment thereto, which he was ready to report when the House will please to receive the same." The House (according to Order) was adjourned during Pleasure, and put into a Committee upon the Bill, intituled, "An Act to explain and amend so much of an Act made in the Twentieth Year of the Reign of His present Majesty, intituled, "An Act to vest certain Messuages, Lands, Tenements, and Hereditaments, in Trustees, for the better securing His Majesty's Docks, Ships, and Stores at Plymouth and Sheerness; and for better defending the Passage of the River Thames at Gravesend and Tilbury Fort, as relates to the Security of His Majesty's Docks, Ships, and Stores at Plymouth." 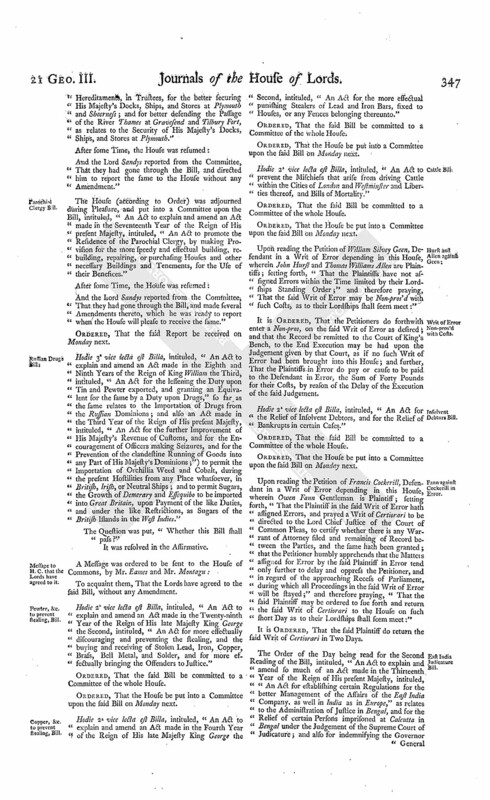 The House (according to Order) was adjourned during Pleasure, and put into a Committee upon the Bill, intituled, "An Act to explain and amend an Act made in the Seventeenth Year of the Reign of His present Majesty, intituled, "An Act to promote the Residence of the Parochial Clergy, by making Provision for the more speedy and effectual building, rebuilding, repairing, or purchasing Houses and other necessary Buildings and Tenements, for the Use of their Benefices." And the Lord Sandys reported from the Committee, That they had gone through the Bill, and made several Amendments thereto, which he was ready to report when the House will please to receive the same." Hodie 3a vice lecta est Billa, intituled, "An Act to explain and amend an Act made in the Eighth and Ninth Years of the Reign of King William the Third, intituled, "An Act for the lessening the Duty upon Tin and Pewter exported, and granting an Equivalent for the same by a Duty upon Drugs," so far as the same relates to the Importation of Drugs from the Russian Dominions; and also an Act made in the Third Year of the Reign of His present Majesty, intituled, "An Act for the further Improvement of His Majesty's Revenue of Customs, and for the Encouragement of Officers making Seizures, and for the Prevention of the clandestine Running of Goods into any Part of His Majesty's Dominions;") to permit the Importation of Orchillia Weed and Cobalt, during the present Hostilities from any Place whatsoever, in British, Irish, or Neutral Ships; and to permit Sugars, the Growth of Demerary and Essequibo to be imported into Great Britain, upon Payment of the like Duties, and under the like Restrictions, as Sugars of the British Islands in the West Indies." The Question was put, "Whether this Bill shall pass? Hodie 2a vice lecta est Billa, intituled, "An Act to explain and amend an Act made in the Twenty-ninth Year of the Reign of His late Majesty King George the Second, intituled, "An Act for more effectually discouraging and preventing the stealing, and the buying and receiving of Stolen Lead, Iron, Copper, Brass, Bell Metal, and Solder, and for more effectually bringing the Offenders to Justice." Copper, &c. to prevent stealing, Bill. Hodie 2a vice lecta est Billa, intituled, "An Act to explain and amend an Act made in the Fourth Year of the Reign of His late Majesty King George the Second, intituled, "An Act for the more effectual punishing Stealers of Lead and Iron Bars, fixed to Houses, or any Fences belonging thereunto." Hodie 2a vice lecta est Billa, intituled, "An Act to prevent the Mischiess that arise from driving Cattle within the Cities of London and Westminster and Liberties thereof, and Bills of Mortality." Hurst and Allen against Geen. Upon reading the Petition of William Silvey Geen, Desendant in a Writ of Error depending in this House, wherein John Hurst and Thomas William Allen are Plaintiffs; setting forth, "That the Plaintiffs have not assigned Errors within the Time limited by their Lordships Standing Order;" and therefore praying, That the said Writ of Error may be Non-pros'd with such Costs, as to their Lordships shall seem meet:"
It is Ordered, That the Petitioners do forthwith enter a Non-pros, on the said Writ of Error as desired; and that the Record be remitted to the Court of King's Bench, to the End Execution may be had upon the Judgement given by that Court, as if no such Writ of Error had been brought into this House; and further, That the Plaintiffs in Error do pay or cause to be paid to the Defendant in Error, the Sum of Forty Pounds for their Costs, by reason of the Delay of the Execution of the said Judgement. Hodie 2a vice lecta est Billa, intituled, "An Act for the Relief of Insolvent Debtors, and for the Relief of Bankrupts in certain Cases." Fann against Cockerill in Error. Upon reading the Petition of Francis Cockerill, Defendant in a Writ of Error depending in this House, wherein Owen Fann Gentleman is Plaintiff; setting forth, "That the Plaintiff in the said Writ of Error hath assigned Errors, and prayed a Writ of Certiorari to be directed to the Lord Chief Justice of the Court of Common Pleas, to certify whether there is any Warrant of Attorney filed and remaining of Record between the Parties, and the same hath been granted; that the Petitioner humbly apprehends that the Matters assigned for Error by the said Plaintiff in Error tend only further to delay and oppress the Petitioner, and in regard of the approaching Recess of Parliament, during which all Proceedings in the said Writ of Error will be stayed;" and therefore praying, "That the said Plaintiff may be ordered to sue forth and return the said Writ of Certiorari to the House on such short Day as to their Lordships shall seem meet:"
It is Ordered, That the said Plaintiff do return the said Writ of Certiorari in Two Days. It was moved, "That the further Consideration of the said Bill be put off to this Day Two Months." Dominus Cancellarius declaravit præsens Parliamentum continuandum esse usque ad et in diem Lunæ, nonum diem instantis Julii, horâ undecimâ Auroræ, Dominis sic decernentibus. Viscount Dudley & Ward. Ds. Say & Sele. Hodie 3a vice lecta est Billa, intituled, "An Act to explain and amend so much of an Act made in the Twentieth Year of the Reign of His present Majesty, intituled, "An Act to vest certain Messuages, Lands, Tenements and Hereditaments in Trustees, for the better securing His Majesty's Docks, Ships and Stores at Plymouth and Sheerness, and for better defending the Passage of the River Thames at Gravesend and Tilbury Fort," as relates to the Security of His Majesty's Docks, Ships and Stores at Plymouth." Hodie 3a vice lecta est Billa, intituled, "An Act for vesting the Parish Church of Saint Christopher le Stocks, in the City of London, and the Materials and Scite thereof, and the Church Yard thereto adjoining, in the Governor and Company of the Bank of England, and their Successors, for ever; and for uniting the said Parish to the Parish of Saint Margaret Lothbury, in the said City." The Lord Walsingham (according to Order) reported the Amendments made by the Committee of the whole House, to the Bill, intituled, "An Act to explain and amend an Act made in the Seventeenth Year of the Reign of His present Majesty, intituled, "An Act to promote the Residence of the Parochial Clergy by making Provision for the more speedy and effectual building, re-building, repairing or purchasing Houses and other necessary Buildings and Tenements for the Use of their Benefices." Pr. 2. L. 33. Leave out from the Word ("Act") to the Word ("and") in Press 7. Line 18. Pr. 8. L. 9. Leave out from the Word ("living") to the Word ("according") in Line 13 of the same Press. The Lord Walsingham also (according to Order) reported the Amendment made by the Committee of the whole House to the Bill, intituled, "An Act for establishing an Agreement with the United Company of Merchants of England trading to the East Indies, for the Payment of the Sum of Four hundred thousand Pounds, for the Use of the Public, in full Discharge and Satisfaction of all Claims and Demands of the Public, from the Time the Bond Debt of the said Company was reduced to One million five hundred thousand Pounds, until the First Day of March One thousand seven hundred and eighty-one, in respect of the Territorial Acquisitions and Revenues lately obtained in the East Indies; and also for securing to the Public, in respect thereof, for a Term therein mentioned, a certain Part or Proportion of the clear Revenues and Profits of the said Company; and for granting to the said Company, for a further Term, the sole and exclusive Trade to and from the East Indies, and Limits therein mentioned; and for establishing certain Regulations for the better Management of the Affairs of the said Company, as well in India as in Europe, and the recruiting the Military Forces of the said Company." The said Amendment was read by the Clerk, as follows; (videlicet). The Carroa Company against Goold. Upon reading the Petition and Appeal of the Carron Company, complaining of certain Parts of an Interlocutor of the Lords of Session in Scotland, of the 5th of July 1781; and praying, "That the same may be reversed, varied or altered, or that the Appellants may have such other Relief in the Premises as to this House in their Lordships great Wisdom shall seem meet; and that James Goold, late of Ferrol, in the Kingdom of Spain, Merchant, may be required to answer the said Appeal:"
It is Ordered, That the said James Goold may have a Copy of the said Appeal, and do put in his Answer thereunto in Writing, on or before Monday the 6th Day of August next; and Service of this Order upon the said Respondent, or upon any of his Counsel or Agents in the Court of Session in Scotland, shall be deemed good Service. Spottiswoode to enter into Recog. on it. The House being moved, "That John Spottiswoode, of Sackville Street, Gentleman, may be permitted to enter into a Recognizance for Carron Company, on account of their Appeal depending in this House, they residing in Scotland:"
It is Ordered, That the said John Spottiswoode may enter into a Recognizance for the said Appellants, as desired. 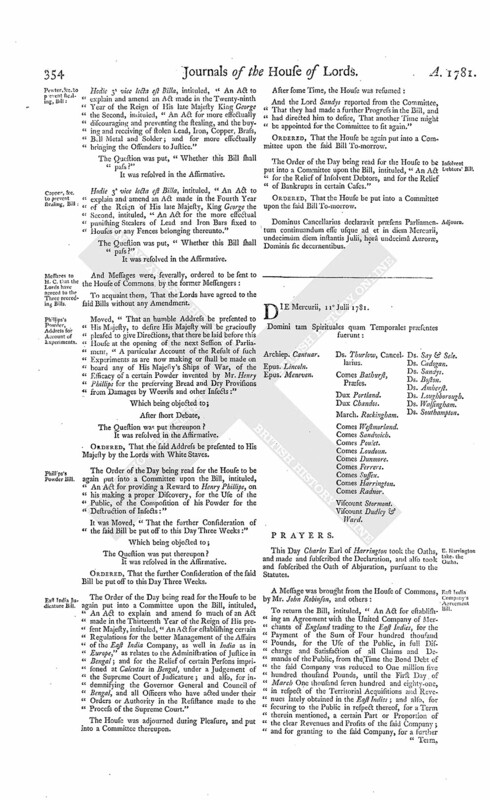 The House (according to Order) was adjourned during Pleasure, and put into a Committee upon the Bill, intituled, "An Act to explain and amend an Act, made in the Twenty-ninth Year of the Reign of His late Majesty King George the Second, intituled, "An Act for more effectually discouraging and preventing the stealing, and the buying and receiving of Stolen Lead, Iron, Copper, Brass, Bell Metal and Solder, and for more effectually bringing the Offenders to Justice." And the Lord Walsingham reported from the Committee, "That they had gone through the Bill, and directed him to report the same to the House, without any Amendment." 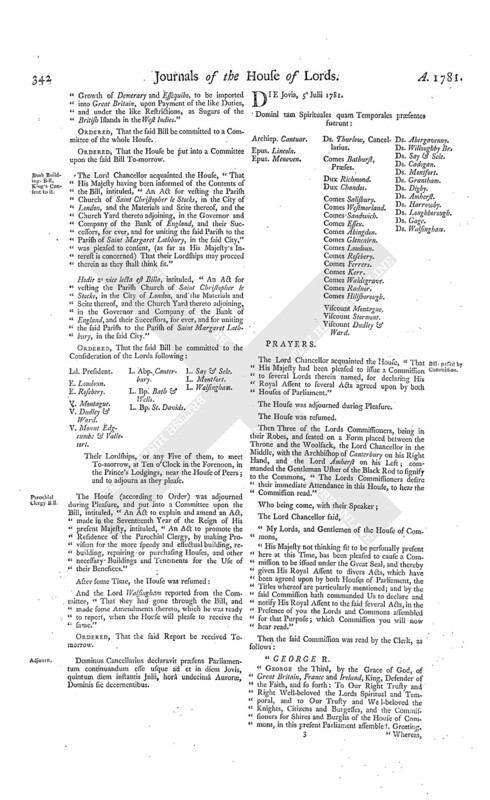 The House (according to Order) was adjourned during Pleasure, and put into a Committee upon the Bill, intituled, "An Act to explain and amend an Act, made in the Fourth Year of the Reign of His late Majesty King George the Second, intituled, "An Act for the more effectual punishing Stealers of Lead and Iron Bars fixed to Houses, or any Fences belonging thereto." The House (according to Order) was adjourned during Pleasure, and put into a Committee upon the Bill, intituled, "An Act to prevent the Mischiefs that arise from driving Cattle within the Cities of London and Westminster, and Liberties thereof, and Bills of Mortality." Salt against Wilkinson and Cooke. Q. "You are, I believe, a Sugar Refiner?" Q. "How long have you been in that Trade?" Q. "Has it, during that Time, been always the Custom of the Trade that the Importer should pay the Whole or any and what Part of the Duties upon Importation?" A. "It has been the Custom for the Importer to pay the whole of the Duty upon Importation; that has been uniformly the Practice." Q. "Can you state what has been the Quantity of Hogsheads annually imported into Great Britain?" A. "The Import into Great Britain in the Years 1774 and 1775 amounted to about 160 Thousand Hogsheads a Year to all England. If the Average was taken for Ten Years farther back it would amount to something above 150,000 Hogsheads a Year." Q. "What has been the Quantity imported during the last Four Years?" A. "During the last Four Years the Average Import will not be more than 115,000 Hogsheads per Year." Q. "Have the Imports ever risen during the last Four Years?" A. "The Average, as I said before, is 115,000 Hogsheads a Year." Q. "In consequence of that Difference in the Quantity imported has the Sugar Manufactory suffered any Detriment?" A. "The Sugar Refining Manufactory has been upon the Decline during the last Four Years. About Five Years ago all the Sugar Houses that were standing in London were occupied; since that Time a considerable Number have become empty, and have been dismanled, after the Owners have found it impossible to let them; and there are at this Time a considerable Number, I believe about Fifteen or upwards, that are now standing either empty or to let." Q. "What Proportion does Fifteen bear to the whole Number?" A. "There are about One Hundred Houses now remaining in the Trade." Q. "Have those that now remain sufficient Employ?" A. "The Sugar Houses during the last Four Years have put themselves in the Train of working only Three Days a Week, because the Demand was found to be so inadequate, that they stood still a great Part of the Year, to their great Disadvantage." Q. "Does it appear to you, for any and for what Reason, that if the Sugars upon Importation are suffered to be warehoused under the King's Lock, that it will tend to hurt the Manufactory, or to increase the Price of Sugar to the Consumer?" A. "We apprehend that the warehousing of Sugars, after the Manner which this Bill tends to promote, must inevitably raise the Price of Sugar; because we have ever found in that Season of the Year in which the Sugar Fleets arrive, that the Quantity which is brought to Market in One Week, or any other given Period, is very large, which has always been attributed to the Pressure of the Duty." Q. "When that Pressure is taken off by the Importers receiving the Price of the First Cargoes that come to Market, has the Consequence of that usually been, that he has withheld from the Market the future Cargoes?" A. "We have always found that the more opulent Merchants who have had it in their Power to withhold the Sugars from the Market, have withheld them till a late Season of the Year, and it is apprehended by the Trade, that Merchants will hold their Sugar longer, and that more Merchants will be enabled to hold their Sugar in consequence of the Provisions of this Bill; and we conclude from thence that when the Pressure of the Duties is so taken off, that the Price will rise, as we have ever found it to do after the Season of paying the Duties." Q. "What Credit has it been usually the Course of the Trade for the Importer to give the Sugar Refiner?" Q. "During those Two Months had the Sugar Refiner a Power of sending to the Warehouse for a Supply of any of the Commodities he had purchased?" A. "We could always at One Day's Notice, and frequently at Two Hour's Notice, get Home the Sugars we had bought; but it was always attended with much Trouble to get together Two Sorts of Men necessary to be upon the Spot to deliver the Sugars, that is, the Warehouse-keeper and the Cooper. Now if these Sugars are put under the King's Lock, a Third Person will be necessary to attend the Delivery of them, that is, a Custom House Officer; the Difficulty there will be to bring together at the same Point of Time Three Persons who reside at a Distance, and consequently are in different Employments, will put the Trade under the greatest Difficulty and Derangement." Q. "Will it be necessary that you may be able to have the Sugar, bought at that Credit, delivered to you, that you should see that the Importer pays the Duty when you make that Contract, or that you should pay it yourselves?" A. "We apprehend it frequently will be found that when we want the Sugar Home, the Importer will not have paid the Duty, and that Delays will thence arise." Q. "Do the Necessities of your Manufacture require that you should have considerable Supplies of Sugar from Time to Time that you may not know the preceding Day that you will want?" A. "The Premises in which our Trade is carried on have been built after a Manner and of a Size suitable to the present Method of carrying on the Trade, there is only Room for a certain Quantity of Sugar within the House; but if it should happen that Custom House Holidays come near together, which is sometimes the Case, our present Premises will not be large enough to enable us to take Home as much Sugar as would be necessary to carry us over the Holidays." Q. "Would that induce upon you a Necessity of enlarging your Buildings, or otherwise incurring a great Expence?" A. "It would induce the Necessity of enlarging our Buildings and of enlarging our Capital." Q. "Has or has not the Consumption of Sugar encreased within the last Four or Five Years?" A. "The principal wholesale Grocers of London complain that the Consumption of Sugar is so decreased in the Country, that the Grocery Trade throughout the Kingdom is under the greatest Difficulties, in consequence of the high Price of Sugar." Q. "Whether the Price of Sugars will be raised to you in consequence of the Importers not paying the Duties; will the Price now paid by the Consumer admit of a proportionable Advance to repay you?" A. "We believe it will be impossible for us to advance the Price of Sugar upon the Consumer; Sugar is at present as dear as we believe any large Quantity of it can be consumed in this Country." Q. "Do you recollect what was the Price which the Importer had for the raw Sugar before the late Duty of Four Shillings and Sixpence was laid on?" A. "Before the present War broke out Brown Sugars were usually sold from Twenty-eight Shillings to Thirty-two Shillings per Cwt. Since the present War they have been sold from Fifty-four Shillings to Sixty-six Shillings per Cwt." Q. "Then it appears to you, from what you know of the Price which Sugars have actually borne, that the raw Commodity sells now at a greater Advantage to the Importer, notwithstanding the increased Duty, than it did before?" A. "We have no Doubt of it, but that the Importer has a Price for his raw Sugar at present, and has had during the last Four Years, which is greatly more than sufficient to indemnify him for all his additional Expences." Q. "Does it appear to you, from what you know of the Trade, that if the Sugars are permitted to be warehoused, the Exportation of the raw Material can be encouraged, and how?" A. "No Exportation of raw Sugar could take place in the Country by the Laws now in being, or in any past Time, of the Sugar Trade, without the Duties having been first paid up upon those Sugars; which Duties having been paid at the Time the Sugars were first warehoused, the Crown have the Use of the Sugar Duty from Two, Four, to even Six or Seven Months before the Duty is refunded; we apprehend the present Payment of 1s. 6d. which will be drawn back as all the former Duties were, does exceedingly facilitate the Exportation of the raw Commodity, because there is clearly a Preference given upon the Face of the Bill to an Importer for a Foreign Market; for if an Importer of Sugar, has Sugar on which he has made the Payment which this Act requires, if he should have made that Payment, only Two Buyers should offer him a Price for his Commodity, the One of whom is a Buyer for the Public here, either as a Refiner or a Grocer, the other a Buyer for a Foreign Market, the importing Merchant must pay up a very large Sum of Money, all the Remainder of the Duties, before this Sugar can be delivered to the Buyer for Home Consumption; whereas he can deliver them to the Buyer for a Foreign Market, without the Advance of another Shilling upon these Duties; thence we imagine, that without any Consideration of the Difference of the Duties, the Foreign Buyer always being enabled to fetch Sugars from hence without the Payment of any Duty with which the Home Consumption is burthened; the mere Circumstance of the Importer being enabled to hand those Sugars over to the Foreign Buyer, after having made so small a Payment as 1s. 6d. per Cwt. only, will very much encourage him to direct his Trade to a Foreign Market." Q. "Can you estimate the Sum, the Use of which the Public will lose for these four, five, six, or seven Months you have mentioned?" A. "The whole Amount of Sugar Duties is somewhere between £.800,000 and a Million Sterling a Year; we apprehend that if the Sugar Merchants should not be encouraged, as we imagine they will be encouraged to hold their Sugars a longer Time by this Bill, but that still holding them in that Manner in which they ever have held them hitherto, that the Crown will lose the Use of the Duties upon an Average at least Three or Four Months." Q. "Has the Trade had Time, since last Week, to consider all the Effects of this Bill, so far as it may affect them in the Refining or in the Consumption?" A. " I believe it is something less than 10 Days since the Trade had the least Intimation that there was an Intention to carry through an Act of Parliament to allow Sugars to be bonded; immediately as it was known, it was the universal Sense of the whole Trade, there was no Two Opinions upon it, that it was a Measure big with Mischiefs to the Interests of the Trade; and that it was the Interest of the Trade, if possible, to endeavour to apprize Parliament of the Inconveniencies and the Losses to which we should be subjected by such a Bill. We intended to trouble your Lordships with Two Counsel, On of our Counsel is not present, and even if he had been present, he has not had his Instructions by which he is to inform your Lordships, so very short has been the Time we have had to prepare Matters to inform your Lordships." Q. "Do you know what Proportion the Duty upon Rum and upon Tobacco bear to the Value of the Commodity ?" A. "I do not; I believe the Duty amounts to more than an Hundred per Cent. upon the Value of the Commodity, Tobacco being at present very dear; I don't know whether it may now or no, but it has usually in former Times amounted to more than an Hundred per Cent. 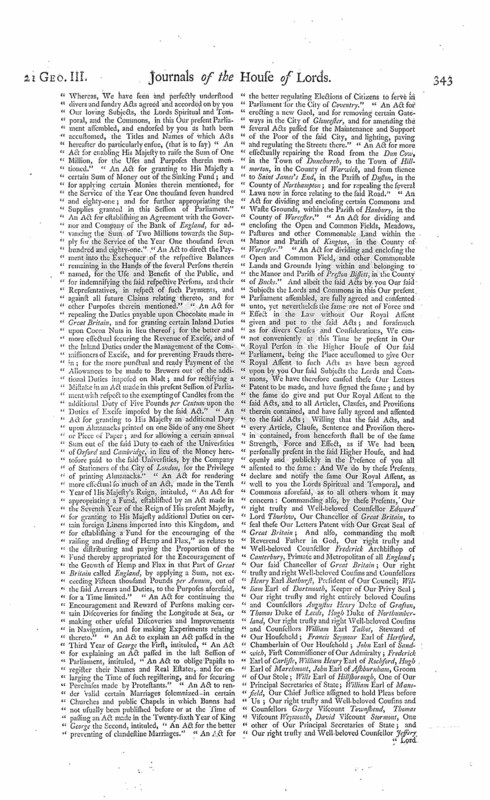 upon the Value of the Commodity; these Two Articles, which are the principal Articles which have been allowed to be bonded, stand in very different Circumstances from the Commodity which is the Subject of the Bill, they are neither of them the Subjects of any material Manufactory in this Country; Sugar is Two Months, Three Months, or Four Months under Process in our Manufacture, during all which Time we have got to find a Capital, though the Sugar Merchant allows us a Credit of Two Months, that must be aided by a large Capital on the Part of the Refiner to enable him to carry on his Trade to Advantage; therefore, if the Operation of this Bill should be such, and we do apprehend it will be such, as that the Payment of the Duties in the First Instance will be transferred from the Sugar Planter to us, we apprehend the Necessity of an Increase of our Capital in the Proportion of One Fifth, will be the immediate Consequence. I must beg your Lordships will allow me to say One Word upon the Motive which has induced the Trade to stand before your Lordships in this Business. It has been said before another very high Auditory, that this is a malicious and vindictive Petition. My Lords, we could not stand before you supporting such a Petition, it is an Apprehension that our best Interests are at Stake that has induced us to oppose this Bill; the Supposition that we could have any such Motive, we apprehend to have arisen from hence; that we were, Two Months ago, Petitioners to the other House of Parliament for Leave to work Prize Sugars, we had been Two Years soliciting the Board of Treasury for their Countenance to a Bill for that Purpose; that Board were pleased to refer the Consideration of that Matter to another Board, who are generally supposed to be the best Judges of that Matter who are learned in the Trade Laws of this Country, and particularly in the Laws of the Plantations; it was the Judgment of that Board, upon the most mature Deliberation, that the Application was founded in Public Utility, and they were pleased to recommend its being carried into Effect; but the Interests of the Planters, we apprehend the Interests of our Opponents, for we had Opponents in the Application, and the very great and powerful Interest of that Body was sufficient to overweigh its Merits; but though we lost our Cause, we have no Motives of Malice, and hope we shall stand clear in your Lordships Opinion from having given your Lordships any Trouble from any such Reason." Q. " I think you state the Import of Sugars to have diminished One Third?" Q. " And the Consumption of Sugar also to have diminished about One Third?" Q. "Then has the Consumption diminished from any other Cause than the Diminution of the Import ?" A. " We apprehend it is diminished from the Advance of Price. There are certain Circumstances in the Sugar Market that prove to us, that it is the Advance of Price that diminishes the Consumption; we find the Price at which refined Sugars stand at this Day is such, that it sets the Country Trade almost at a Stand; we should have been very glad to have produced some wholesale Grocers before your Lordships as Witnesses in this Matter, they are the best Judges how the Price affects the Consumption. They declare that many Counties in England where the Consumption was carried to the greatest Extent, have almost laid aside the Commodity." Q. "Has the Export of raw Sugars encreased since that Time ?" A. "No; it has decreased ever since the high Price." Q. "Because if the Import of raw Sugars has decreased as One Third and if the Consumption has also decreased as One Third, and if the Export has not encreased, how does it appear that there is any other Cause for the Decrease of the Consumption, except the Decrease of the Material ?" A. "The whole Export Trade of this Country of raw Sugar, in the largest Years of Export that we have known, has been so small, that your Lordships would not find, if you had the Papers before you, that it stood in the Proportion of One Twentieth Part of the Importation, and therefore the Fluctuations of that Part of the Trade that has only at any Time amounted to One Twentieth Part of the Whole cannot greatly affect the Question, when your Lordships are considering of a Diminution of One Third." Q. "Upon your Experience what is the Price which, when Sugars arrive to it, immediately causes a Decrease of the Consumption ?" A. "We have found that Brown Lump Sugar which is the great Article of Consumption in the Kingdom, when it has reached Ninety Shillings a Hundred Weight it has been almost at a Stand; about Five Years ago that Commodity commonly fold at Fifty-four Shillings per Hundred Weight. Your Lordships will easily imagine that an Advance of a Commodity from Fifty-four Shillings to Ninety Shillings per Hundred Weight must have a considerable Operation." Q. "When you speak of the Encrease of the Price since the Duty was laid, do you mean that there was any Encrease of the Price anterior to that by the Importers ?" A. "The Encrease of the Price has been greater at Times anterior to the laying the new Duty on, than it ever has been since; Sugar has always been too much an Object of Speculation, and during so short an Import as we have had for these last Four Years, prodigious Speculations have been made in the Commodity. I can assure your Lordships, that the Sugar of the same Quality, which has been sold for Twenty-eight Shillings a Hundred Weight, I have seen sold for Seventy-four Shillings a Hundred Weight, which is a greater Advance than I took the Liberty to state to your Lordships, because it was one of those Instances that lasted only Ten Days or a Fortnight." Q. " Do you mean to say that within the Space of Ten Days or a Fortnight the Encrease of the Price of Sugar has been as from Twenty-eight to Seventy-four?" A. "I mean during the Times of great Speculation when the Market has been at the highest, that Brown Sugars, such as I have stated to have been sometimes at Sixty-six Shillings, have arose to the greater Extremity of Seventy-four Shillings." Q. "The Aim of my Question was to know from you as a Man of Experience, what Fluctuation of the Price you have observed to be occasioned by Speculation?" A. "We have seen at one Time an Advance of Sixteen Shillings a Hundred Weight in one Week in the Price of Sugar, and the usual Fluctuation in ordinary Times is not more than Five Shillings in the whole Fluctuations of a Year in Times of Peace." Q. "According to your Observation of this Speculation, and of the Consequences that you have described of it, has that appeared when the Market was pinched in former Times, or has it also appeared when the Market was very full of Sugar?" A. "Seldom when the Market was full, more so when there was only a small Quantity weekly brought to Market." Q. "You are a Sugar Broker?" Q. "How long have you been in that Trade ?" A. " About Fifteen Years." Q. "From what you know of the Sugar Trade, have you any, and what Reason to think, that if Sugars should be allowed to be warehoused under the King's Lock upon a Payment of a small Part of the Duty, they will be brought to Market as speedily under the present, (fn. 4) the past Mode of paying the Duty?" A. " Certainly I think they will not; the Merchant will have an Opportunity from the great Credit that he will have given him for the Duties, to withhold a great Part of his Importation till such Time as it may suit him, or that the Market may induce him to bring them forward." Q. " Will not that Circumstance necessarily raise the Price of the Commodity to the Refiner and the Consumer ?" A. " I apprehend that the less Quantity of any Article that is brought to Market, will cause the Price to be higher necessarily than if there was a great Plenty." Q. " I understand you are not concerned as a Refiner yourself." A. " I am not." Q. " Can you state what was the Price of Brown Sugar at the opening of the last Year ?" A. "At the opening of the last Year, about this Time Twelve Months, the Price of Brown Sugar was from about Fifty Shillings to Fifty-two Shillings per Hundred Weight." Q. " From what you know of the State of the Market, what do you believe the same Sugars would fetch at the opening of the Market this Season." A. " It is rather saying a great Deal for me, to pretend to fix a Price upon the opening of the present Market, but I apprehend the Price of such Sugar as last Year sold from Fifty Shillings to Fifty-two Shillings per Hundred Weight, may at the opening of the Market this Year fetch Fifty-six Shillings, Fifty-eight Shillings, or perhaps Sixty Shillings per Hundred Weight." Q. " Is it your Opinion that the Price of Sugars bears now such a Proportion to the Amount of the Duties, that the Importer has as large a Profit upon his Commodity as when the Duty was less ?" A. " I apprehend that the Consumer will pay the additional Duty, if he gives Fifty six Shillings or Fifty-eight Shillings per Hundred Weight, from what last Year, when there was a Difference of Four Shillings in the Duty, and he only gave from Fifty Shillings to Fifty-four Shillings." Q. " Do you mean by the Consumer, the Consumer or the Refiner ?" A. "The Refiner in the first Instance certainly will pay that Advance to the Merchant of Six Shillings per Hundred Weight." Q. "Do you conceive, from your Knowledge of the Trade, that locking up these Sugars under the King's Lock will be a great Inconvenience to it ?" A. "I apprehend it will be a great Inconvenience to the Trade, and will be attended with infinite Difficulty." Q. " Will it necessarily hurt the Profits of the Re finer ?" A. " I apprehend the Refiner must employ a greater Capital to carry on his Manufactory; and I don't suppose the Profit upon his Produce will be greater, or so great as it was before." Q. "What is that Price to which, when Sugar arrives, the Market totally fails, or fails in a very extraordinary Degree ?" A. "Does your Lordship mean Raw Sugars ?" Q. " Yes, Raw Sugars." A. " I have known, when any Accident has happened to our Fleets, or losing an Island, that the Advance has been Four Shillings, Five Shillings, and Ten Shillings per Hundred Weight, in the Course of a Week or Ten Days." Q. " Does the Quantity of the Consumption upon that decrease so as to lessen the Market, or does the Market bear the additional Price, and continue still as full as ever ?" A. " It sometimes happens that Merchants are of different Opinions upon Occasions of that Kind; they will not bring so much to Market as they would have done had not such a Circumstance happened." Q. " As Sugar arises in its Prices, the Demand for it in the general Market of the Kingdom (I speak now of Grocers and others) will decrease ?" Q. "Does it decrease in a certain Proportion as Sugars rise, or is there a Price at which, when they arrive, the Market decreases in a greater Proportion ?" A. "I suppose, upon an Advance of Sugar Six Shillings per Hundred Weight, the Demand will not be half so much as before; if it gets up to Ten or Twelve Shillings a Hundred Weight, which I have known to have been the Case, there is almost a total Stop put to it." Q. "Are you concerned in any Manufactory ?" A. "Yes, I am a Potter." Q. "From what you have observed of that Manufac tory, is it decreased within the last Four Years ?" A. "My Business has decreased full half within the last Four Years." Q. "To what Cause do you attribute that Decrease in your Manufactory?" A. " For want of the Sugar Refiners working as they used to do formerly: The Sugar Refiners have not been able to work Three or Four Days a Week; and their Goods which I manufacture has served them from Time to Time over and over again: I had Sixty Men, and am reduced to Twenty, all through the Sugar Manufactory." Q. " Do you know any others in your Manufactory that are reduced by the same Cause ?" A. " There are Three more besides myself; there formerly were Nine of us; Five are broke." Q. "Does any Thing which has a Tendency to hurt the Sugar Manufactory hurt your Manufactory?" A. "It does; I wholly depend upon the Sugar Manufactory; there were Nine Potters, now there are but Four; and I don't know how many there may be of them long; I know some are in Gaol, and some run away; and I have much to do to be where I am." It was moved, "That the said Bill be committed to a Committee of the whole House on this Day Two Months." The same was agreed to and ordered accordingly. 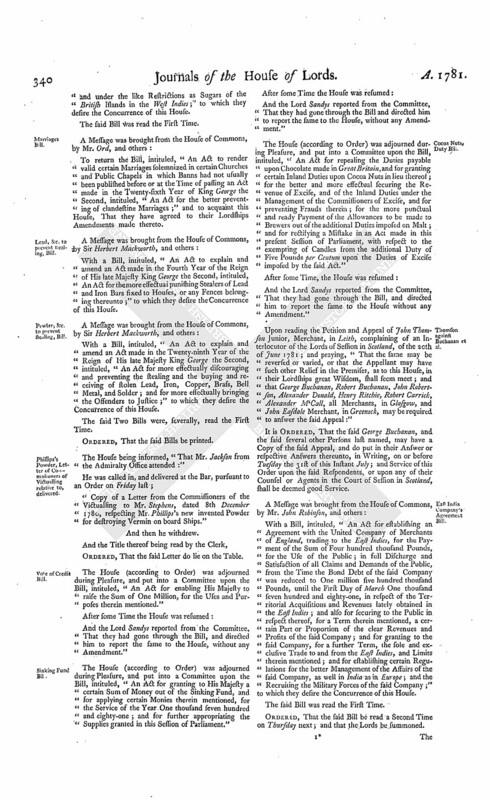 The Order of the Day being read for the House to be put into a Committee upon the Bill, intituled, "An Act to explain and amend so much of an Act, made in the Thirteenth Year of the Reign of His present Majesty, intituled, " An Act for establishing certain Regulations for the better Management of the Affairs of the East India Company, as well in India as in Europe," as relates to the Administration of Justice in Bengal, and for the Relief of certain Persons imprisoned at Calcutta in Bengal, under a Judgement of the Supreme Court of Judicature; and also for indemnifying the Governor General and Council of Bengal, and all Officers who have acted under their Orders or Authority in the Resistance made to the Process of the Supreme Court." And the Lord Sandys reported from the Committee, That they had made a Progress in the Bill, and had directed him to desire, That another Time might be appointed for the Committee to sit again." Ordered, That the House be again put into a Committee upon the said Bill To-morrow. The Order of the Day being read for the House to be put into a Committee upon the Bill, intituled, "An Act for the Relief of Insolvent Debtors, and for the Relief of Bankrupts in certain Cases:"
Dominus Cancellarius declaravit præsens Parliamentum continuandum esse usque ad et in diem Martis, decimum diem instantis Julii, horâ undecimâ Auroræ, Dominis sic decernentibus. This Day Henry Lord Teynham fat first in Parliament after the Death of his Father Henry Lord Teynham; his Lordship having first at the Table taken the Oaths, and made and subscribed the Declaration, and also taken and subscribed the Oath of Abjuration, pursuant to the Statutes. Hodie 3a vice lecta est Billa, intituled, "An Act for establishing an Agreement with the United Company of Merchants of England trading to the East Indies, for the Payment of the Sum of Four hundred thousand Pounds for the Use of the Public, in full Discharge and Satisfaction of all Claims and Demands of the Public, from the Time the Bond Debt of the said Company was reduced to One million five hundred thousand Pounds until the First Day of March One thousand seven hundred and eighty-one, in respect of the Territorial Acquisitions and Revenues lately obtained in the East Indies; and also for securing to the Public in respect thereof, for a Term therein mentioned, a certain Part or Proportion of the clear Revenues and Profits of the said Company; and for granting to the said Company for a further Term, the sole and exclusive Trade to and from the East Indies and Limits therein mentioned; and for establishing certain Regulations for the better Management of the Affairs of the said Company, as well in India as in Europe; and the recruiting the Military Forces of the said Company." Hodie 3a vice lecta est Billa, intituled, "An Act to explain and amend an Act made in the Seventeenth Year of the Reign of His present Majesty, intituled, An Act to promote the Residence of the Parochial Clergy, by making Provision for the more speedy and effectual building, re-building, repairing or purchasing Houses and other necessary Buildings and Tenements for the Use of their Benefices." Messages to H.C. with Amendments to the Two preceding Bills. To return the said Bills, and acquaint them, That the Lords have agreed to the said Bills with some Amendments, to which their Lordships desire their Concurrence. Hodie 3a vice lecta est Billa, intituled, "An Act to prevent the Mischiefs that arise from driving Cattle within the Cities of London and Westminster and Liberties thereof, and Bills of Mortality." Hodie 3a vice lecta est Billa, intituled, "An Act to explain and amend an Act made in the Twenty-ninth Year of the Reign of His late Majesty King George the Second, intituled, "An Act for more effectually discouraging and preventing the stealing, and the buying and receiving of stolen Lead, Iron, Copper, Brass, Bell Metal and Solder; and for more effectually bringing the Offenders to Justice." Hodie 3a vice lecta est Billa, intituled, "An Act to explain and amend an Act made in the Fourth Year of the Reign of His late Majesty, King George the Second, intituled, "An Act for the more effectual punishing Stealers of Lead and Iron Bars fixed to Houses or any Fences belonging thereunto." 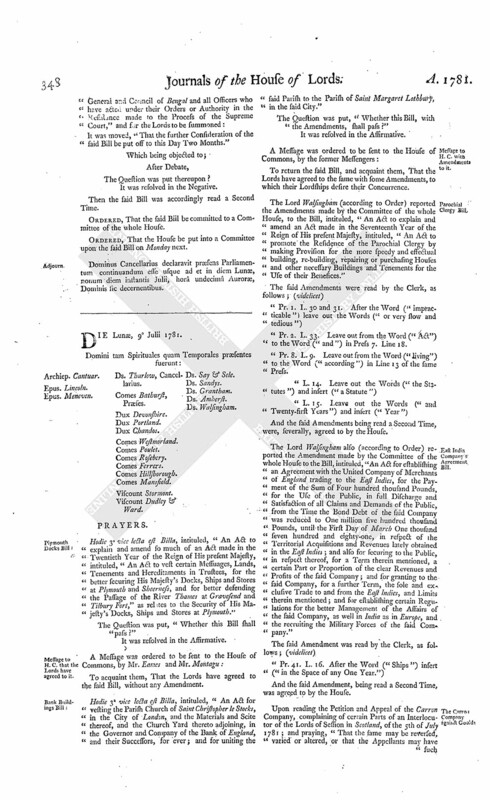 Messages to H.C. that the Lords have agreed to the Three preceding Bills. To acquaint them, That the Lords have agreed to the said Bills without any Amendment. Phillips's Powder, Address for Account of Experiments. Moved, "That an humble Address be presented to His Majesty, to desire His Majesty will be graciously pleased to give Directions, that there be laid before this House at the opening of the next Session of Parliament, "A particular Account of the Result of such Experiments as are now making or shall be made on board any of His Majesty's Ships of War, of the Efficacy of a certain Powder invented by Mr. Henry Phillips for the preserving Bread and Dry Provisions from Damages by Weevils and other Insects:"
The Order of the Day being read for the House to be again put into a Committee upon the Bill, intituled, "An Act for providing a Reward to Henry Phillips, on his making a proper Discovery, for the Use of the Public, of the Composition of his Powder for the Destruction of Insects:"
It was Moved, "That the further Consideration of the said Bill be put off to this Day Three Weeks:"
Ordered, That the further Consideration of the said Bill be put off to this Day Three Weeks. 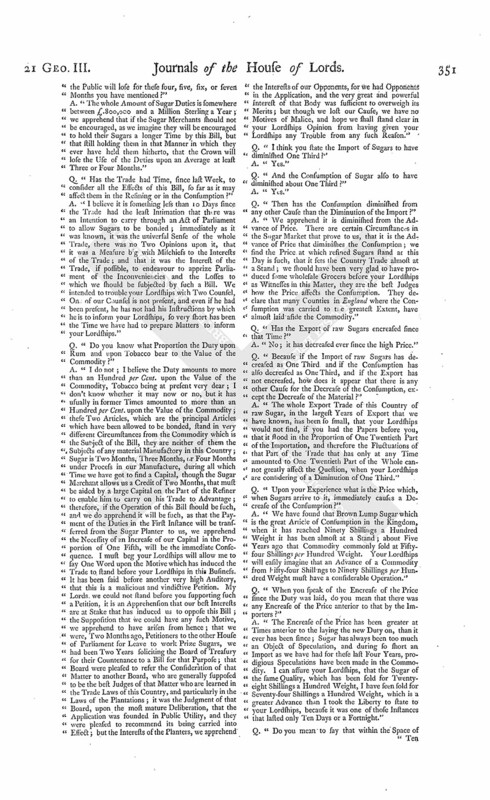 The Order of the Day being read for the House to be again put into a Committee upon the Bill, intituled, "An Act to explain and amend so much of an Act made in the Thirteenth Year of the Reign of His present Majesty, intituled, "An Act for establishing certain Regulations for the better Management of the Affairs of the East India Company, as well in India as in Europe," as relates to the Administration of Justice in Bengal; and for the Relief of certain Persons imprisoned at Calcutta in Bengal, under a Judgement of the Supreme Court of Judicature; and also, for indemnifying the Governor General and Council of Bengal, and all Officers who have acted under their Orders or Authority in the Resistance made to the Process of the Supreme Court." And the Lord Sandys reported from the Committee, That they had made a further Progress in the Bill, and had directed him to desire, That another Time might be appointed for the Committee to fit again." The Order of the Day being read for the House to be put into a Committee upon the Bill, intituled, "An Act for the Relief of Insolvent Debtors, and for the Relief of Bankrupts in certain Cases." Dominus Cancellarius declaravit præsens Parliamentum continuandum esse usque ad et in diem Mercurii, undecimum diem instantis Julii, horâ undecimâ Auroræ, Dominis sic decernentibus. 1. So in the Original.